The Idaho football program began 126 years ago in 1893, and through the 2017 season, the Vandals have an all-time record of 463–611–27 (.433). They have played in three bowl games in their history, all victories in the Humanitarian/Famous Idaho Potato Bowl in Boise in 1998, 2009, and 2016. As a Division I-AA (FCS) program for 18 seasons (1978–1995), Idaho made the playoffs eleven times and advanced to the national semifinals twice (1988, 1993). On April 28, 2016, university president Chuck Staben announced the football program would return to the Big Sky and FCS in 2018. This followed the Sun Belt Conference's announcement on March 1 that the associate membership of Idaho and New Mexico State for football would end after the 2017 season. Idaho is the first FBS program to voluntarily drop to FCS. The University of Idaho fielded its first football team in 1893. It wasn't until 1917 that the program earned its nickname, the Vandals, after the UI basketball team under alumnus Hec Edmundson played defense with such ferocity that they "vandalized" their opponents and, thus, the nickname of Vandals was adopted for all school sports. Fred Herbold served as the Vandals head football coach in 1900 and 1901, compiling a record of 4–2–1. In 1902, John G. Griffith was hired as head football coach and athletic director at the University of Idaho. When Iowa football coach Alden Knipe retired after the 1902 season, school officials considered hiring Griffith but went with John Chalmers instead. Griffith continued as Idaho's head football coach through 1906, and is Idaho's longest tenured head football coach to date. The Vandals' first-ever forward pass was attempted against Washington State in 1907: it was completed for a touchdown from a drop-kick formation in the fourth quarter and led to a 5–4 victory. Following the First World War, Thomas Kelley led the Vandals for two years, then left for Missouri. He played college football as a tackle at the University of Chicago under head coach Amos Alonzo Stagg, and was previously the head coach at Alabama. In coach Robert Mathews' four seasons as head coach, the Vandals' first years in the Pacific Coast Conference, they won three consecutive rivalry games over Washington State. Idaho lost the other, Mathews' first in 1922, by a single point, and he remains the only Idaho head coach to date with multiple wins over Washington State. The Vandals made their first significant use of the forward pass under Mathews. Charles Erb was hired in May 1926 as head coach and director of athletics of the Vandals, where he compiled a 10–9–5 record in three seasons, including a PCC co-championship in 1927. Erb was the quarterback at California in the early 1920s on the Wonder Teams of hall of fame head coach Andy Smith. Leo Calland led Vandal football (and the UI athletic department) from 1929–1934, compiling a record of 21–30. He was a lineman for USC in the early 1920s and was the Trojans head basketball coach for two seasons. After Idaho, Calland was the football coach at San Diego State for seven seasons. On February 23, 1935, Ted Bank, a heralded football player at Michigan under Fielding Yost, was named the 14th head football coach of the Idaho Vandals, leaving his post as running backs coach at Tulane in New Orleans. He would stay in Moscow through the completion of the 1940 season. Following a 4–3–1 record in his third season on the Palouse in 1937, Bank was on the short list of many to succeed Harry Kipke as head coach at Michigan, his alma mater. Bank denied interest in replacing Kipke, a teammate at Michigan, and told the press, "I am perfectly satisfied at Idaho. I have not been contacted by the Michigan athletic board and would think twice before leaving Idaho." In January 1938, Idaho's state board of education announced that Bank had signed a three-year contract renewal and would remain as the university's football coach and director of physical education. His best season came that season, when the Vandals finished with a record of 6–3–1, with victories over Oregon State, Utah, and Utah State, and a tie with Washington. The 1937 and 1938 seasons were Idaho's only winning seasons in football between 1927 and 1963, when the Vandals went 5–4 as an independent under head coach Dee Andros (the tenth game on November 23 was canceled). The 1938 season was the highest winning percentage (.650) between 1927 and 1971. Consecutive winning seasons at Idaho were not achieved again until 1982–83 under Dennis Erickson in the Big Sky Conference in NCAA Division I-AA. (Idaho had fifteen consecutive winning seasons from 1982–96.) The successes of 1937 and 1938 was not maintained as Idaho went 2–6 in 1939 and 1–7–1 in 1940 (and winless in conference games), giving Bank a six-year overall record of 18–33–3 (.361). Bank was fired as the Vandals' head football coach in January 1941, part of an upheaval that included the resignation of head basketball coach Forrest Twogood. Longtime college football coach Francis Schmidt was hired at Idaho in March 1941, he was previously the head coach at Ohio State University of the Big Ten Conference. The team was 4–5 in 1941 and 3–7 in 1942, but a lack of civilian manpower prior to the 1943 season due to World War II forced several PCC teams to put their programs on hiatus in September, including Idaho. Schmidt stayed on campus and assisted in the physical training of troops, but his health worsened in 1944 and he died in a Spokane hospital in September. Alumnus James "Babe" Brown was the interim athletic director and basketball coach during the war, then led the Vandals football program in 1945 and 1946, compiling records of 1–7 and 1–8. He returned to the high school ranks in southern Idaho and later coached at the College of Idaho. Dixie Howell, a former star running back at Alabama under Frank Thomas, was hired as head football coach at Idaho in February 1947, and guided the usually-struggling Vandals to a promising 4–4 record in his first season in Moscow], the Vandals' best since 1938. The Vandals beat Stanford on the road, a team that had defeated them 45–0 the previous year (but went winless in 1947). It was Idaho's second-ever football victory over a PCC team from California, following a victory over first-year UCLA in 1928. The Vandals also knocked off an undefeated Utah in the season finale in Boise. The Vandals drew a Palouse and state record crowd to Neale Stadium for their annual rivalry game with Washington State in October, albeit a close 7–0 loss to the Cougars. These promising factors earned Howell a two-year contract extension through 1950. The progress did not continue, as the Vandals opened the 1948 season with four losses and went 3–6 overall and 1–5 in conference, defeating only Montana for the Little Brown Stein. Idaho played Washington State close at Rogers Field in Pullman and gave Oregon a scare in Moscow. The Webfoots, with Norm Van Brocklin and John McKay, went 7–0 in conference and were co-champions with California. Howell's relationship with Idaho fans and the administration was strained following the 1949 season. The Vandals went 3–5 and 1–4 in conference that season, defeating only departing Montana again. Their two non-conference wins were against overmatched opponents Willamette and Portland, and the Vandals were severely outscored 230–45 in their five losses, capped by a 63–0 loss at Stanford to end the season. Howell felt compelled to publicly deny rumors in April that he would leave before the 1950 season; the Vandals went 3–5–1 record (1–1–1 in conference), and Howell's contract was not renewed in March 1951. Assistant coach Raymond "Babe" Curfman remained on campus as interim head coach for the upcoming 1951 spring drills after Howell's departure. The administration was impressed with his handling of the team during the first week of practice and made him the permanent head coach in mid-April. He guided the Vandals for three seasons in the Pacific Coast Conference and compiled a 7–19–1 (.278) record. His salary in his final year at Idaho in 1953 was $7,920. Curfman and the Vandals made headlines during the 1953 season as Idaho struggled in conference play in the PCC. Curfman resigned as Idaho's head coach in December 1953. Skip Stahley, former head football coach at Toledo, returned to college football in February 1954 as the head coach of the Vandals. at an annual salary of $9,000. The Vandals had finished the 1953 season at 1–8 under third-year head coach Babe Curfman. Stahley compiled a 22–51–1 (.304) record in eight seasons in Moscow. While on the Palouse, he coached future NFL notables Jerry Kramer, Wayne Walker, Jim Prestel, and AFL all-star Jim Norton. The Vandals were members of the Pacific Coast Conference for Stahley's first five seasons, then played as an independent when the conference disbanded. Idaho's only conference victory under Stahley came in his first season: the winless Vandals (0–5) surprised and shut out rival Washington State 10–0 in Pullman in the Battle of the Palouse in 1954. It was Idaho's first victory in football over the Cougars in 29 years, and the subsequent march by WSC students from Pullman to Moscow was featured in Life magazine: The win started a four-game winning streak, Idaho's longest in 31 years, to finish at 4–5 for the 1954 season. The Vandals, who became an independent in 1959 after the dissolution of the Pacific Coast Conference, waited a full decade before they beat the Cougars again, in 1964. When Idaho athletic director Bob Gibb left in 1960, Stahley took over those duties in July for four years. He handled both jobs for a year and a half, then stepped down under pressure as football coach in January 1962, but remained as athletic director until mid-1964. Illinois assistant coach Dee Andros became head coach of the Vandals at age 37 at in February 1962, and his starting annual salary was just under $12,500. Andros served in the U.S. Marines during World War II and saw action at Iwo Jima; he later played on the line at Oklahoma under Bud Wilkinson. The 1962 team was 2–6–1, but the following year he led Idaho to its first winning season (5–4) in a quarter century. The tenth and final game of the 1963 season, a road game at Arizona State on November 23 was canceled, following the assassination of President John F. Kennedy. The Vandals won their opener in 1964, but then lost four straight, the latter two were close ones to Oregon and Oregon State. The 10–7 loss to the Rose Bowl-bound Beavers in Corvallis came by a late third quarter OSU punt return. The Vandals rebounded and the next week won the Battle of the Palouse for the first time in a decade, defeating neighbor Washington State 28–13. The Cougars were led by first-year head coach Bert Clark, a former Sooner teammate of Andros. The Vandals split the final four games to finish at 4–6. While Idaho had joined Division I-AA and the Big Sky Conference as a charter member in 1963, the Vandals remained an independent for football through 1964 under Andros. Only one conference foe was played during the first two Big Sky seasons, a 1963 game with Idaho State that was previously scheduled. Andros spent three seasons at Idaho, with an overall record of 11–16–1. Steve Musseau, an assistant coach for the Vandals and previously at Orange Coast College, was selected as the next Vandals head coach in 1965. Musseau's 1965 team, with fullback Ray McDonald, won the Battle of the Palouse over Washington State for the second straight year, this time on the road in Pullman, and finished at 5–5. Although Idaho was a charter member was the Big Sky Conference in 1963, it had only played one conference game in football in the first two seasons, a previously scheduled game against Idaho State. Idaho was a "university division" program and a longtime member of the defunct PCC, while the other four football-playing members of the Big Sky were "college division" (Division II). Under Andros, Idaho viewed the six-team Big Sky as an answer to its basketball scheduling problems, as well as other sports, but had desired to continue as an independent at the top level in football. Directed by the conference to comply, Idaho played its first full conference schedule in football in 1965 and was 3–1 for the first two seasons, but posted a disappointing 2–2 in the third. A November defeat at Weber State and non-conference blowout losses at Washington State (14–52) and Houston (6–77) closed out the 1967 season at 4–6 overall. Although his 13–17 (.433) record was better than each of the previous eight head coaches, pressure from alumni and boosters forced Musseau's resignation, despite a signed petition by the Vandal football players that he remain for a fourth year. His salary during his final year as head coach was US$13,900. Coach Y C McNease succeeded Musseau as the Vandals' head football coach and placed a new emphasis on the passing game; the 1968 Vandals were 5–5 (3–1 in Big Sky), but the next year the team struggled with injuries and slipped to 2–8 with only one win in conference in 1969. After just two seasons in Moscow, McNease was dismissed as head coach in May 1970 following spring practices. Though reasons were not fully disclosed by the university, it was attributed to his disciplinary tactics and player unrest. Additionally, an altercation reportedly occurred with a player in a Memorial Gym hallway and resulted in a ripped coat. Several months after his dismissal, McNease filed a $1 million breach of contract lawsuit in U.S. District Court against the University of Idaho. An out-of-court settlement was reached in 1973 for just under $24,800. When McNease was dismissed after spring drills in May 1970, Don Robbins was promoted from an assistant coach to head coach of the Vandals. His 1971 team had the best record (8–3) in the history of the school, but the next two seasons were less successful and he was dismissed in November 1973. After Robbins' departure, the Idaho athletics administration turned to yet another Vandals assistant coach to fill its head coaching vacancy. Ed Troxel, who had served as an assistant coach of the staffs of Musseau, McNease and Robbins, was promoted to the position of head coach. Troxel had turned down the head football job in May 1970 and again in December 1973, but later accepted after persuasion from his players and concessions from the new athletic director, namely a fourth assistant coach. His annual salary for the first season in 1974 was $16,500, which was $1,500 less than his predecessor Don Robbins. One of Troxel's notable hires was his first offensive coordinator, a 27-year-old Dennis Erickson, who was hired away from Montana State and stayed for two seasons. His replacement was Jack Elway, recently at WSU, but Elway left in March after just five weeks on staff to become a Division II head coach in southern California at Cal State Northridge. Despite this turnover at OC before Troxel's third season in 1976, the Vandals went 7–4 (5–1 in the Big Sky), with center John Yarno selected as a Division I first-team AP All-American. At the time, it was the Vandals' second best football record in history, surpassed only by the 1971 team at 8–3. With key players lost to graduation and beset by injuries, Idaho fell to 3–8 in 1977 and five weeks later, on December 30, Troxel was asked to resign by new UI president Richard Gibb. The involuntary resignation ended Troxel's four years as head coach and 11 football seasons at the university. The Vandals finally turned to a coach from outside the Idaho program to hire its 25th head coach, choosing Air Force offensive line coach Jerry Davitch. Davitch was a relatively inexperienced coach, he had served as a high school head coach from 1969–1972 at Salpointe Catholic High School in Tucson, Arizona and as a position coach under Ben Martin at Air Force for five years; from 1973–1975 as wide receivers coach and as offensive line coach from 1976–1977. Davitch's annual salary in 1978 was $26,000. Davitch hired Bill Tripp as offensive coordinator and retained defensive coordinator Greg McMackin from Ed Troxel's staff. At the time, the Idaho football program had posted just four winning seasons in over four decades, and the last four head coaches had been fired after three or four seasons. In addition, no Vandal head football coach had left with a winning record since 1928. Davitch retained the veer option on offense, but the progress was slow in his first two seasons. In 1978, the Vandals finished 2–9. They began the season by losing their first five games; a 31–14 loss to I-A opponent San Jose State, a 28–0 shutout to their I-A rival Washington State in the Battle of the Palouse, a 28–6 loss to Wichita State, a 34–29 defeat at the hands of Northern Arizona and a 53–14 blowout by I-A UNLV. Idaho broke through with their first on October 14 with a 34–30 win over rival Montana for Little Brown Stein. Davitch's team then lost their next three; 57–21 to Montana State, 51–6 to Weber State and 48–10 to in-state archrival Boise State.The Vandals' final win of the 1978 season was an unplayed forfeit by Idaho State for a scheduled night game in Moscow in November. Flying from Pocatello to the Palouse on the afternoon of the game because of unavailable lodging, one of ISU's two chartered Convair 440 aircraft had carburetor problems soon after takeoff and had to land. It carried the defensive players; the other with the offense landed safely at the Moscow-Pullman airport two hours later. After difficulties in arranging a viable makeup date, a forfeit win was awarded to the Vandals. It was the conference finale for both teams, Davitch's squad finished the season with a 41–28 loss to I-A foe Fresno State. After the 1978 season, defensive coordinator Greg McMackin left to join Jack Elway's San Jose State staff as defensive backs coach. Tim Hundley was hired as his replacement. Idaho finished 4–7 in 1979. They dropped their first two games of the season; a 30–10 loss to I-A Fresno State on September 8 and a 29–18 loss to Northern Arizona on September 15. Davitch's team then won their next three; defeating Pacific (17–13), D-II Puget (34–10), and Idaho State (28–23). After a 41–17 loss to in-state adversary Boise State, Idaho defeated Montana by a score of 20–17 for Little Brown Stein on October 20. The Vandals lost their last four to close the season, losing to Montana State by a count of 28–20, Nevada by a score of 38–26, Weber State to the tune of 12–7 and South Dakota State by a score of 27–13. In 1980, the improving Vandals went 6–5 with redshirt freshman quarterback Ken Hobart, with a 4–3 record in conference play. The "Gold Rush" Vandals were picked as one of the top five teams in Division I-AA by Sports Illustrated before the 1981 season. The Vandals lost close games and then were hit by injuries; they lost their final six games to finish at 3–8 in 1981, winless and in last place in the Big Sky. (Mercurial Idaho State won the Big Sky and the Division I-AA title in 1981.) Davitch compiled a record of 15–29 (.341) in his four seasons in Moscow and became the fifth consecutive head coach to fired. He was notified nine days before his final game (a 43–45 home loss to rival Boise State, the defending I-AA national champions). On December 11, 1981, San Jose State offensive coordinator Dennis Erickson was named the 26th head football coach of the Idaho Vandals. Erickson had prior ties to the Vandals football program, serving as offensive coordinator under Ed Troxel from 1974–1975. He had also served as offensive coordinator at Fresno State from 1976–1978 under Jim Sweeney and Bob Padilla and before joining Jack Elway's San Jose State staff in 1979. Erickson was an early pioneer of the spread offense and installed the system when he took over as the Vandals head coach. He hired by UI athletic director Bill Belknap and accepted a one-year contract at $38,001. Both of Erickson's coordinators, offensive coordinator Keith Gilbertson and defensive coordinator John L. Smith, would go on to lead the Vandals football program themselves. Building on his reputation as an offensive innovator, Erickson became Idaho's all-time winningest head coach in just four seasons. He took them to the I-AA playoffs in his first and fourth seasons. In his first season, Erickson took an underachieving (and injured) 3–8 team in 1981 and immediately turned it into a 9–4 playoff team, led by decathlete quarterback Ken Hobart. The Vandals began the season with a 34–14 loss to Washington State in the Battle of the Palouse. Idaho then won its next four defeating Pacific (36–17), Portland State (56–0), Weber State (35–34) and Northern Iowa (38–13). On October 16, Erickson's team lost Little Brown Stein to Montana by a score of 40–16. Erickson's squad regrouped to win another four in a row, starting with a 36–20 win over Montana State. Next was a 24–17 win over archrival Boise State on October 30. On November 6, Idaho defeated Idaho State by a count of 20–17. Next came a 55–37 win over Northern Arizona before the Vandals lost to Nevada by a score of 25–16. After winning a rematch with Montana by a score of 21–7 in the first round of the 1982 NCAA Division I-AA playoffs, the Vandals lost to Eastern Kentucky in the quarterfinals by a score of 38–30. The Vandals went 8–3 in 1983. The season kicked off with a 43–28 win over NAIA opponent Southern Colorado on September 10 behind quarterback Ken Hobart's I-AA record setting performance of 37 of 59 for 527 passing yards and six touchdown passes. The Vandals then shut out Montana State by a score of 23–0. After a 41–31 loss to Idaho State Idaho defeated Eastern Washington (38–24) and Portland State (17–16). After a 28–10 loss to Weber State, Idaho went on a three-game win streak; defeating Montana for Little Brown Stein by a score of 45–24, Pacific by a score of 31–19 and Northern Arizona by a score of 40–10. Idaho finished 6–5 in 1984. They began the season with a 49–14 shellacking of Portland State on September 8. The Vandals then dropped their next two; losing to Cal State Fullerton by a count of 28–7 and Montana State by a score of 34–28. Idaho then upset I-A foe Oregon State of the Pac-12 Conference on September 29 by a score of 41–22. Erickson's Vandals embarked upon a three-game losing streak; dropping games to Nevada (23–17), Weber State (40–37), and Eastern Washington (32–25). The Vandals finished the 1984 season with four wins; defeating Montana for Little Brown Stein by a score of 40–39, Northern Arizona by a score of 37–9, Idaho State by a score of 45–42 and archrival Boise State in a 37–0 shutout. Erickson led the Vandals to a 9–3 record in 1985. They started the season with a 43–28 loss to Oregon State on September 7 but won their next six; beating D-II Mankato State by a count of 46–7, Northern Arizona by a margin of 27–3, Nevada by a score of 25–21, Portland State by a score of 51–17, Weber State by a margin of 31–28 and Montana for Little Brown Stein in a 38–0 shutout. After a heartbreaking 38–37 loss to Idaho State on October 26, the Vandals won their next three; defeating Eastern Washington by a count of 42–21, Montana State in a 34–0 shutout and archrival Boise State by a score of 44–27 in the regular season finale. Idaho lost in the first round of the 1985 NCAA Division I-AA Playoffs in a rematch with Eastern Washington by a score of 42–38. Erickson's overall record with the Vandals was 32–15 (.681), 31–13 (.705) in the regular season and 1–2 in the post season. He went 4–0 against archrival Boise State, a team which had dominated the series by winning the previous five games. (The winning streak against the Broncos reached 12 games; it was broken in 1994 when BSU advanced to the I-AA finals.) His most notable recruits at Idaho were his quarterbacks – future NFL head coach Scott Linehan, who had future Vandals head coach Tom Cable blocking for him, and future College Football Hall of Famer John Friesz, who had Mark Schlereth blocking for him. Erickson revived Vandal football and quickly turned it into a top I-AA program, but he wouldn't stick around. Erickson departed after the 1985 season to accept the head coaching position at Wyoming. From there, Erickson had successful head coaching tenures at Washington State and Miami before serving as a head coach with the NFL's Seattle Seahawks and San Francisco 49ers. He also served as head coach at Oregon State and Arizona State. But what folks couldn't imagine was a return from Coach Erickson, which would happen in 2006. After Erickson's departure, Idaho promoted offensive coordinator Keith Gilbertson to head coach. Gilbertson had served as a graduate assistant at three schools: Idaho State from 1971–1974, Western Washington in 1975 and Washington in 1976 before joining Bruce Snyder's staff at Utah State as offensive coordinator, a position he held from 1977–1981 before joining Erickson's staff at Idaho as offensive coordinator in 1982. Gilbertson hired Bill Diedrick and Kent Baer as his offensive and defensive coordinators. As a result of his personal roots in Washington and his years as an assistant coach in both states, Gilbertson had extensive recruiting ties in Washington and Idaho. In his three seasons in Moscow as head coach, Gilbertson's win-loss record was 28–9 (.757). In Gilbertson's first season, the Vandals finished with an 8–4 record. They began the season with a 42–10 win over NCAA Division II opponent Portland State. After losing to I-A opponent Central Michigan by a score of 34–21, Gilbertson's squad defeated Cal State Fullerton by a count of 25–17 on September 20. The Vandals followed that victory with two more wins; a 27–10 win over Eastern Washington and a 38–26 win over Idaho State. The Vandals lost their next two games; a 23–17 defeat at the hands of Nevada and a 24–0 shutout at the hands of Northern Arizona. Idaho finished off the regular season by reeling off four straight wins; 38–31 over Montana, 44–17 over Montana State, 31–17 over Weber State and 21–14 over archrival Boise State. Gilbertson's Vandals lost in the first round of the 1986 NCAA Division I-AA football playoffs in a rematch with Nevada by a score of 27–7 on November 29. Idaho went 9–3 in 1987. They began the season on September 5, defeating Minnesota State by a score of 31–17. After a 30–18 loss to I-A opponent Central Michigan, the Vandals won their next two, defeating D-II opponent Portland State by a count of 17–10 and Northern Arizona by a count of 46–37. After a 30–21 loss to Idaho State on October 3, the Vandals won their last six games of the regular season; defeating Montana by a score of 31–25 in the Little Brown Stein rivalry game, Nevada by a score of 38–28, Eastern Washington by a score of 31–24, Weber State by a score of 41–38, Montana State by a score of 14–7 and rival Boise State by a score of 40–34 behind redshirt sophomore quarterback John Friesz's 423 passing yards and four touchdown passes. The Vandals lost in the first round of the 1987 NCAA Division I-AA Playoffs to Weber State by a score of 59–30. The Vandals posted their best record under Gilbertson in 1988, finishing 11–2. The season began on September 10 with a 27–18 win over Portland State. The next week, they defeated Pacific by a score of 36–26. After a 26–17 loss to Montana, Idaho won their next nine; 31–20 over Northern Arizona, 41–24 over Montana State, 31–22 over Eastern Washington, 27–24 over Weber State, 32–31 over Nevada after overcoming an 18-point deficit in the fourth quarter, 41–7 over Idaho State, 26–20 over archrival Boise State in the regular season finale, 38–19 in a rematch with Montana in the first round of the 1988 NCAA Division I-AA Playoffs and 38–30 over Northwestern State in the quarterfinal round of the playoffs. Gilbertson's team fell short in the national semifinal round, losing by a score of 38–7 to Furman on December 10. Following consecutive conference championships and advancing to the Division I-AA national semifinals, Gilbertson interviewed for the UTEP head coaching position in December 1988 but withdrew from consideration. Days later on Christmas Eve, he accepted an offer to coach the offensive line in the Pac-10 at Washington in Seattle, Washington under head coach Don James and offensive coordinator Gary Pinkel. Washington State defensive coordinator John L. Smith was hired to replace Keith Gilbertson. A native of Idaho Falls, Idaho, Smith had prior ties to the Vandals football program, serving as defensive coordinator for the Vandals from 1982–1985 under Dennis Erickson. 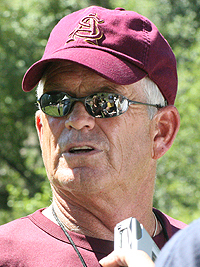 Smith, who had no prior head coaching experience, also served as defensive coordinator at Nevada from 1977–1981 under Chris Ault and at Wyoming (1986) and Washington State (1987–1988) under Erickson. Smith posted a 53–21 record (.716) in six seasons as the head coach at Idaho. Under his leadership, the Vandals won two Big Sky conference championships and made the 16-team NCAA Division I-AA playoffs five times, advancing to the national semifinals in 1993. Smith's 53 wins are the most in school history. His starting annual salary at Idaho was under $60,000, but in 1991 he became the first UI head coach to be granted a multi-year contract. Smith inherited an 11–2 team from Keith Gilbertson that had made the I-AA semifinals in 1988, and returned All-American quarterback in John Friesz. The Vandals finished 9–3 in 1989. They lost their first two games of the 1989 season to Washington State (41–7) and Portland State (29–20). The Vandals then won their next nine to close the regular season, topping Sacramento State by a score of 45–3, Weber State by a score of 46–33, Montana to the tune of 30–24, Northern Arizona by a margin of 41–31 behind John Friesz's five touchdown passes, Montana State by a count of 41–7 behind Friesz's 340 passing yards and two touchdown passes, Eastern Washington by a competitive 41–34 score, Nevada by a count of 42–22, Idaho State by a score of 47–31 and archrival Boise State by a competitive score of 26–21 in the regular season finale. Smith's team lost in the first round of the 1989 NCAA Division I-AA Playoffs, falling in a 38–21 contest to Eastern Illinois on November 25. Idaho went undefeated (8–0) in conference play in 1989, the only time in school history. Friesz won the Walter Payton Award after the 1989 season and was drafted in the sixth round with the 138th overall pick in the 1990 NFL Draft by the San Diego Chargers and spent a decade playing in the NFL. Idaho finished 9–4 in 1990. They began the season with a heartbreaking 27–24 loss to Montana State. After defeating Texas State by a score of 38–35, the Vandals lost to I-A opponent Oregon by a blowout score of 55–23. Smith's squad then defeated Weber State by a score of 37–27 and lost to Nevada by a margin of 31–28. The Vandals then embarked upon a seven-game winning streak, defeating Chico State by a margin of 59–21, Idaho State by a count of 41–20, Eastern Washington by a score of 51–28, Northern Arizona by a blowout score of 52–7, Montana by a score of 35–14 for Little Brown Stein, and rival Boise State by a margin of 21–14 in the regular season finale. Idaho defeated Missouri State by a score of 41–35 in the first round of the 1990 NCAA Division I-AA Playoffs but lost a heartbreaker to Georgia Southern in the quarterfinals by a score of 28–27. The Vandals went 6–5 in 1991. Smith led his team to three victories to start the season; 49–7 over Sonoma State, 41–38 over Texas State and 48–14 over Montana State. The Vandals then lost their next three; dropping contests to Northern Iowa (36–14), Nevada (31–23) and Weber State (45–17). Smith's Vandals alternated between win and loss for the remainder of the season; defeating Idaho State by a score of 46–21, losing a close contest to Eastern Washington by a count of 34–31, beating Northern Arizona by a margin of 44–28, losing a 35–34 nail biter to Montana for Little Brown Stein and defeating adversary Boise State by a count of 28–24. The Idaho Vandals compiled a 9–3 record in 1992. They jumped out of the gate to win their first six of the season, defeating St. Cloud State by a margin of 42–9, I-A opponent Colorado State by a margin of 37–34, Weber State by a margin of 52–24, Cal State Northridge by a margin of 30–7, Idaho State by a margin of 49–18 and Eastern Washington by a margin of 38–21. Smith's squad suffered its first loss of the season in their seventh game, a heartbreaking 27–26 defeat to Northern Iowa. After a 53–14 blowout win over Northern Arizona, the Vandals lost Little Brown Stein to Montana by a margin of 47–29. Smith's team closed the regular season with two wins; a 28–7 triumph over Montana State and a 62–16 shellacking of in-state archrival Boise State. Idaho lost in the first round of the 1992 NCAA Division I-AA Playoffs to McNeese State by a margin of 23–20. Idaho went 11–3 in 1993. For the second consecutive year, the Vandals won their first six games of the season; topping Stephen F. Austin by a score of 38–30, Texas State by a count of 66–38, Weber State in a shutout by a blowout score of 56–0, I-A foe Utah by a count of 28–17, Idaho State by a margin of 56–27 and Eastern Washington by a margin of 49–10. Smith's team suffered its first defeat of the season on October 23 with a 40–35 loss to Montana State. On October 30, Idaho defeated Northern Arizona by a score of 34–27. That was followed with a 54–34 loss to Montana on November 6. The Vandals set a school record for points scored in a game with a 77–14 win over Lehigh on November 13. The Vandals routed Boise State in a 49–16 victory in the regular season finale on November 20. Smith led the Vandals to two wins in the 1993 NCAA Division I-A Playoffs, defeating Louisiana-Monroe by a score of 34–31 in the first round and Boston University by a score of 21–14 in the quarterfinal round. The Vandals fell short in the semifinal round, losing to Youngstown State by a score of 35–16. Quarterback Doug Nussmeier, who threw for over 10,000 yards during his college career and won the Walter Payton Award in 1993; was selected in the fourth round with the 116th overall pick in the 1994 NFL Draft by the New Orleans Saints. The Vandals finished 9–3 in 1994. Smith's team began the season 7–0; defeating Southern Utah (43–10), I-A opponent UNLV (48–38), Stephen F. Austin (58–26), Idaho State (70–21), Eastern Washington (40–15), Montana State (27–13) and Northern Arizona (41–14). Idaho suffered its first loss of the season on October 29 in their annual matchup with Montana for Little Brown Stein, falling to the Grizzlies by a score of 45–21. After defeating Northern Iowa by a score of 21–12 on November 5, the Vandals broke their school record for points scored in a single game they set one year earlier when they defeated Weber State by an astonishing 79–30. Idaho suffered a heartbreaking defeat in the regular season finale by falling to their archrivals, Boise State, by a margin of 27–24 to end Idaho's twelve-game winning streak in the rivalry series. The Vandals lost to McNeese State in the first round of the 1994 NCAA Division I-AA Playoffs by a score of 23–20 on November 26. Smith left Idaho after the 1994 season for I-A school Utah State, where he would serve as head coach from 1995–1997, and later led the football programs at Louisville (1998–2002), Michigan State (2003–2006), and Arkansas (2012). On December 22, 1994, it was announced that the University of Idaho would leave I-AA and the Big Sky Conference and return to I-A football as members of the Big West Conference effective July 1, 1996. The Vandals finished 6–5 in 1995. Tormey's team lost its first game of the season by a score of 14–7 to I-A opponent Oregon State After a 66–3 drubbing of D-II Sonoma State, Idaho lost their next two; dropping contests to Idaho State (26–21) and Montana State (16–13). The Vandals rebounded to win their next two; topping Eastern Washington by a score of 37–10 and Montana for Little Brown Stein by a margin of 55–43. After a 25–19 loss to Weber State, the Vandals won their last three games of the regular season; defeating Northern Arizona by a count of 17–14, Northern Iowa by a score of 16–12 and archrival Boise State by a margin of 33–13. The Idaho Vandals fell short in the first round of the 1995 NCAA Division I-AA Playoffs, losing to McNeese State by a score of 33–3. Tormey led Idaho to a second straight 6–5 record in 1996, their first season back in I-A and as members of the Big West Conference. The Vandals started the season on August 31 with a close 40–38 loss to Wyoming. That was followed by a 40–21 loss to San Diego State on September 7. They recorded their first win of the season in their third game against St. Mary's with a 52–17 drubbing. After losing Texas State by a score of 27–21, the Vandals won two in a row; defeating Cal Poly by a margin of 38–33 and Nevada by a margin of 24–15. After a 35–28 loss to former head coach John L. Smith and Utah State, the Vandals defeated I-AA Eastern Washington by a margin of 37–27 and New Mexico State by a margin of 34–19. After a 24–17 loss to North Texas on November 16, the Vandals demolished Boise State by an astonishing 64–19. Idaho went 5–6 in 1997. A 14–10 loss to Air Force on August 30 kicked off the season. Then, the Vandals recorded consecutive shutouts, demolishing I-AA opponents Portland State 46–0 and Idaho State 43–0. After a humbling 41–10 loss to UCF on September 20, Idaho defeated North Texas by a count of 30–17 and I-AA UC-Davis by a count of 44–14. Tormey's team suffered a three-game losing streak; falling to Nevada by a score of 42–23 on October 18, Utah State by a score of 63–17 on October 25 and I-AA Eastern Washington by a count of 24–21. After defeating New Mexico State by a margin of 35–18, Idaho lost to in-state adversary Boise State by a margin of 30–23 in overtime after blowing a 23–6 lead third quarter lead. In 1998, the Vandals' made their first-ever bowl appearance in the Humanitarian Bowl, a 42–35 victory over 16-point favorite Southern Miss. The Vandals earned the bowl berth by winning the Big West title with a dramatic one-point overtime win over rival Boise State, on the road in Bronco Stadium in Boise. (Although this was Idaho's 15th win in the last 17 games in this rivalry, the 1998 win remains their most recent over BSU.) The bowl victory propelled Idaho to an impressive 9–3 record in 1998, their third season back in Division I-A, and Tormey was named coach of the year in the Big West. Before the season, the Sporting News had Idaho ranked last of 112 teams in Division I-A. Tormey interviewed in early January for the open head coaching position at Washington in Seattle which eventually went to Rick Neuheisel. Tormey also interviewed for the head coaching position at Oregon State, which eventually hired former Vandals head coach Dennis Erickson to replace Mike Riley. The Vandals went 7–4 in 1999. They began the season with a 48–21 win over I-AA foe Eastern Washington. After losing to Auburn by a score of 30–23, earned a 28–17 win over neighboring Washington State. It was Idaho's first football victory over WSU in 34 years, breaking the Cougars' 14-game winning streak in the lopsided series. The next week, Idaho lost to Wyoming by a score of 28–13. Then, Idaho won its next three; defeating North Texas by a score of 28–10, Arkansas State by a score of 30–24 and Utah State by a score of 31–3. After losing by a score of 42–14 to New Mexico State, the Vandals won their next two; beating Nevada 42–33 and I-AA opponent Montana 33–30. Tormey's squad finished the 1999 season with a 45–14 loss to in-state rival Boise State. Following the 1999 season, Tormey left his alma mater to become head coach at Nevada. On December 14, 1999, Colorado offensive coordinator Tom Cable was named the Vandals 30th head football coach. Cable played offensive lineman for the Vandals from 1983–1986 under Dennis Erickson and Keith Gilbertson and served as a graduate assistant from 1987–1988 under Gilbertson. After serving another stint as a graduate assistant at San Diego State for one year in 1989, Cable went on to serve as an assistant coach at Cal State Fullerton, UNLV and California before joining Rick Neuheisel's staff at Colorado in 1998 and being promoted to offensive coordinator the following year by new head coach Gary Barnett. He signed a three-year contract at $170,000 per year ($120,000 base and $50,000 media bonus) plus $30,000 in incentives. Cable's first year, 2000, was his best, with a 5–6 record. The Vandals kicked off the season with a 44–20 loss to #14 Washington on September 2. The following week, Idaho lost to I-AA opponent Montana by a score of 45–38. That was followed by a 42–13 loss to Oregon on September 16. Cable's team earned its first win of the season the next week by defeating their rivals from eight miles down the road, a 38–34 win over Washington State. The next week, the Vandals defeated I-AA foe Montana State by a whopping 56–7. On October 7, Idaho lost to West Virginia by a score of 28–16. Idaho recorded its third win of the season the next week by defeating Arkansas State 42–25. After losing to Utah State by a score of 31–14, Cable's Vandals won their next two; beating North Texas 16–14 on November 4 and New Mexico State 44–41 on November 11. The Vandals closed the season with a 66–24 loss to their in-state rivals, Boise State, on November 18. In 2001, the University of Idaho joined the Sun Belt Conference as a football-only member (they joined the conference in all sports in 2003). That year, the football team finished 1–10. They lost their first eight games of the season; a 36–7 thumping by their rival Washington State, a 36–29 loss to Arizona, a 53–3 blowout loss to #13 Washington, a 45–13 loss to their bitter rival Boise State, a 70–58 loss to Middle Tennessee in which the teams compiled 1,445 yards of total offense set an NCAA Division I scoring record for most points scored in a game, a 46–39 loss to New Mexico State, a 57–34 disappointment to Louisiana–Lafayette and a 34–31 heartbreaker to Arkansas State. On November 3, the Vandals finally broke through with their first win of the season, defeating Louisiana-Monroe by a score of 42–38. The next week, Cable's team lost to North Texas by a score of 50–27. They finished the 2001 season with an embarrassing 33–27 loss to I-AA Montana on November 24 in a game that had been rescheduled from September due to the terrorist attacks of September 11, 2001. The Vandals finished 2–10 in 2002. They began the season with a 38–21 loss to their in-state adversary Boise State. The next week, Idaho faced its other rival, #11 Washington State and lost by a score of 49–14. Idaho dropped to 0–3 the following week after a 58–21 lopsided loss to #13 Oregon. Cable's team notched their first win of the season on September 21 with a 48–38 victory over San Diego State. The Vandals fell to #13 Washington in a 41–27 defeat on September 28. That was followed by another loss to I-AA Montana to the tune of 38–31, their second straight year losing to the I-AA Grizzlies. After a 34–14 loss to Louisiana-Monroe on October 12, the Vandals got their second win of the season on October 26, topping Middle Tennessee by a score of 21–18. Following a 31–28 loss to Louisiana–Lafayette, the Vandals lost a 10–0 defensive struggle to North Texas. Cable's Vandals finished the season with a 38–29 loss to Arkansas State and a 35–31 loss to New Mexico State. Idaho finished 3–9 in 2003. They were shut out by Washington State to the tune of 25–0 in the season's opening game. An ugly 8–5 loss to I-AA opponent Eastern Washington followed on September 6. The struggles didn't stop there, as the Vandals lost to their heated in-state rival Boise State by a score of 24–10. Then came a 45–14 loss to #19 Washington followed by yet another loss to I-AA foe Montana to the tune of 41–28. On October 4, Cable's Vandals broke through and won their first game of the season with a 35–31 victory over New Mexico State. Idaho then lost their next four; falling to North Texas (24–14), Middle Tennessee (28–21), Louisiana–Lafayette (31–20) and Arkansas State (24–23). The Vandals finished the season on a high note; winning their last two over Louisiana-Monroe (58–20) and Utah State (20–13). Following the 2003 season, Cable became the first Idaho head football coach fired in 22 years when he was dismissed by newly hired athletics director Rob Spear. Cable's four predecessors had all achieved success in with the Vandals and moved on. He left with a disappointing record of 11–35 (.239) in four losing seasons. USC linebackers coach Nick Holt was hired to replace Tom Cable, becoming the Vandals' 31st head football coach. Holt spent nine years at Idaho as an assistant coach (defensive line coach, 1990–1993; defensive coordinator, 1994–1997) under John L. Smith and Chris Tormey. 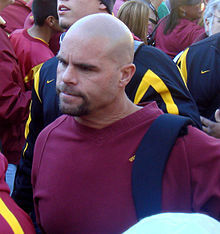 From 2001–2003, Holt served as linebackers coach at USC under Pete Carroll and helped develop the likes of Lofa Tatupu, Darnell Bing, Collin Ashton and others who helped the Trojans capture the 2003 national championship and begin their run of dominance under Pete Carroll in the 2000s. Holt signed a four-year contract with Idaho that paid him $205,000 per year. On June 4, 2004, it was announced that the University of Idaho would leave the Sun Belt Conference and join the more geographically-friendly Western Athletic Conference beginning in fall 2005. The Vandals went 3–9 in 2004, which was their last season in the Sun Belt Conference. They began the Holt era by losing to archrival Boise State by a score of 65–7 on September 4. The following week, they fell to Utah State by a score of 14–7. Idaho faced Pac-10 opponents over the next two weeks, losing to rival Washington State by a score of 49–8 and Oregon by another lopsided score of 48–10. Holt earned his first win as a head coach and the Vandals earned their first win of the season on October 2 with a 45–41 win over Eastern Michigan. After losing a tight game by a score of 16–14 to Louisiana-Monroe, Holt's squad defeated Louisiana–Lafayette by a more comfortable 38–25. They then lost to Middle Tennessee by a score of 34–14 and Troy in a blowout 47–7. After defeating Arkansas State by a score of 45–31, the Vandals lost to North Texas (51–29) and Hawaii (52–21). During the 2004 season, in September, redshirt freshman cornerback Eric McMillan was shot and killed outside his on-campus apartment after a dispute with two Seattle acquaintances. The two suspects were convicted and sentenced to 8–20 years in prison. Idaho finished 2–9 in 2005, their first season in the WAC. They kicked off the season against their rivals from Pullman, losing to the Cougars by a score of 38–26. On September 10, the Vandals lost to UNLV by a score of 34–31. After losing to Washington in by a lopsided 34–6, Holt's team was shut out by Hawaii to the tune of 24–0. On October 1, Idaho earned its first win of the season with a 27–13 victory over Utah State. They then got blown out by Nevada to the tune of 62–14 and #24 Fresno State by a score of 40–10. Idaho picked up its second win of the season on October 29 with a thrilling 38–37 double overtime win over New Mexico State. After losing a close 41–38 game to Louisiana Tech, Holt's squad lost to archrival Boise State in a 70–35 shellacking and San Jose State by a score of 26–18. During Holt's short tenure as head football coach at Idaho, a game was scheduled between the Vandals and his former Trojans for September 1, 2007 at the Los Angeles Coliseum in Los Angeles. Holt decided to take the offer to play the game for a few reasons: it offered the Idaho Vandals an opportunity to increase program visibility to recruits in the region, it gave the Vandals a rare chance to play on national television and get national exposure and the University of Idaho would receive $600,000 from the University of Southern California for the appearance. However, despite a contract that ran through the 2008 season, Holt departed after just two seasons and a 5–18 record to rejoin Pete Carroll's staff at USC to serve as defensive coordinator/defensive line coach for the Trojans, 19 months before the game between the Vandals and the Trojans was to be played. On February 8, 2006, in a surprise turn of events, it was announced that Dennis Erickson had been rehired as the Vandals head coach after Nick Holt's departure. Almost immediately, news of Erickson's rehiring resulted in boosts in ticket sales and booster donations to the football program. When asked at his (re)introductory press conference if Idaho was indeed a long-term arrangement, Erickson responded, "You want to look at the age on my driver's license?...This, hopefully, is going to be my last job." Erickson hired Dan Cozzetto as offensive coordinator and Jeff Mills as defensive coordinator, while retaining the entire defensive staff he inherited from Nick Holt. Erickson signed a five-year contract worth about $1.5 million with performance bonuses that could've pushed the total to as much as about $2.5 million. Erickson's rejuvenated 2006 Vandals broke to a 4–3 record and were and 3–0 in the WAC, then lost their final five conference games to finish at 4–8 overall and sixth in the WAC. Erickson's squad started the season with a 27–17 loss to Michigan State and a 56–10 loss to rival Washington State. The Vandals earned their first win of the season on September 16 with a close 27–24 win over I-AA in-state opponent Idaho State. After a 38–0 shutout loss to Oregon State, Idaho won their next three; defeating Utah State 41–21, New Mexico State 28–20 and Louisiana Tech 24–14. However, Erickson's squad lost its last five games of the regular season; dropping contests to archrival #18 Boise State by a score of 42–26, Hawaii by a whopping 68–10, Nevada by a score of 45–7, Fresno State in a shutout 34–0 and San Jose State by a score of 28–13. Erickson wouldn't stay true to his word, as he left the Vandals to accept the position of head coach at Arizona State just one year after returning to Moscow. Washington State defensive coordinator Robb Akey was hired to replace Erickson, and was the first Idaho head coach since Jerry Davitch without previous ties to the Vandals football program, either as a former player or coach. However, Akey had familiarity with the program, as he lived eight miles from the University of Idaho campus for eight seasons, with Idaho as an opponent in each of those seasons. In addition, Akey either played or coached against the Vandals for a dozen seasons (1984–1995), while a player and assistant coach in the Big Sky Conference. Idaho went 1–11 in 2007. Akey's team kicked off the season against #1 USC, losing by a score of 38–10. After defeating I-AA opponent Cal Poly by a score of 20–13, the Vandals lost their ten games of the season; falling to rival Washington State by a score of 45–28, Northern Illinois by a score of 42–35, #19 Hawaii by a score of 48–20 (despite intercepting Hawaii quarterback Colt Brennan five times), San Jose State by a score of 28–20, Fresno State by a score of 37–24, New Mexico State by a score of 45–31, Nevada by a score of 37–21, Louisiana Tech by a score of 28–16, archrival #17 Boise State by a score of 58–14 and Utah State by a score of 24–19. The Vandals finished 2–10 in 2008. They kicked off the season with a blowout loss, a 70–0 shutout at the hands of Arizona on August 30. Akey's team rebounded the following week to defeat in-state I-AA opponent Idaho State by a score of 42–27 and break its eleven-game losing streak dating back to the previous season. The Vandals would then lose their next six; beginning with a 51–28 loss to Western Michigan on September 13. Next was a 42–17 loss to Utah State and a 45–17 loss to San Diego State. Idaho lost to Nevada by a score of 49–14 on October 4. Losses to Fresno State (45–32) and Louisiana Tech (46–14) followed before Idaho defeated New Mexico State by a score of 20–14 on October 25. The Vandals closed the season with three losses; 30–24 to San Jose State, 45–10 to archrival #9 Boise State and 49–17 to Hawaii. Akey's team compiled an impressive 8–5 record in 2009. The Vandals started the season with a 21–6 win over New Mexico State. After losing to Washington by a score of 42–23, Idaho won its next five; beating San Diego State (34–20), Northern Illinois (34–31), Colorado State (31–29), San Jose State (29–25) and Hawaii (35–23). Idaho's defense got gashed on October 24, losing to Nevada by a score of 70–45. The following week, Idaho edged Louisiana Tech by a score of 35–34. Akey's squad then lost their next three to close the regular season; dropping games to Fresno State (31–21), archrival #6 Boise State (63–25) and Utah State (52–49). The Vandals were offered and accepted a berth in the 2009 Humanitarian Bowl, where they defeated Bowling Green by a score of 43–42. Offensive lineman Mike Iupati was the team's best player that season. He started all 12 games at left guard, played 807 snaps and had 49 knockdowns and 21 pancake blocks. He did not allow a quarterback sack all year and just five defensive players he blocked that season even pressured quarterbacks Nathan Enderle and Brian Reader. On November 24, 2009, Iupati was named one of three finalists for the Outland Trophy, alongside Russell Okung and winner Ndamukong Suh. Iupati was a consensus 2009 All-American and also named first team All-WAC. He was the first Idaho Vandal to receive All-American honors since John Yarno in 1976 and the first All-American from the WAC since Ryan Clady in 2007. Iupati, who was a senior during the 2009 season, was drafted in the first round with the 17th overall pick in the 2010 NFL Draft by the San Francisco 49ers. Iupati was the highest selected Idaho Vandal in the NFL Draft since Ray McDonald went 13th overall to the Washington Redskins in the 1967 NFL Draft. On March 15, 2010, it was announced that the University of Idaho administration had given Robb Akey a contract extension and raise. That year, Idaho finished 6–7. They began the season with a 45–0 shutout win over FCS opponent North Dakota. Idaho lost to #6 Nebraska by a score of 38–17 on September 11. The Vandals alternated between win and loss over the next five games; defeating UNLV by a score of 30–7, losing to Colorado State by a score of 36–34, beating Western Michigan by a score of 33–13, losing to Louisiana Tech by a score of 48–35 and defeating New Mexico State by a score of 37–14. They then lost their next three; falling to Hawaii 45–10, #25 Nevada 63–17 and archrival #4 Boise State 52–14. On November 20, Idaho defeated Utah State by a score of 28–6. After losing to Fresno State by a score of 23–20, the Vandals defeated San Jose State by a score of 26–23 to finish the season. The Idaho Vandals regressed to 2–10 in 2011. They started the season with a 32–15 loss to Bowling Green on September 1. After defeating FCS foe North Dakota by a score of 44–14, the Vandals lost by a score of 37–7 to #9 Texas A&M. That was followed by a 48–24 loss to Fresno State on September 24. The Vandals lost to Virginia by a score of 21–20 on October 1. Losses to Louisiana Tech (24–11), New Mexico State (31–24) and Hawaii (16–14) followed before Akey's squad defeated San Jose State by a score of 32–29 on November 5. Idaho finished the 2011 season with three losses; a 42–7 blowout at the hands of BYU on November 12, a 49–42 double overtime heartbreaker to Utah State on November 19 and a humbling 56–3 shellacking at the hands of Nevada on December 3. Idaho finished 1–11 in 2012. They began the year with a 20–3 loss to FCS opponent Eastern Washington on August 30. Next was a 21–13 loss to Bowling Green. Idaho then traveled to Baton Rouge, Louisiana for a showdown against #3 LSU, losing to the Tigers by a score of 63–14. After losing a nail biter in overtime to Wyoming by a score of 40–37, the Vandals were shut out by North Carolina in a 66–0 blowout, a game in which the Tar Heels set a school record for points scored in a single game. It was on October 6 that the Vandals finally broke through with their first win of the season, defeating New Mexico State. Idaho then lost to Texas State by a score of 38–7 and Louisiana Tech by a score of 70–28. Akey was fired as Idaho's head coach after the Louisiana Tech game. Akey departed the Vandals with a record of 20–50. Offensive coordinator Jason Gesser was named interim head coach for the season's final four games, all defeats. The Vandals finished the season with losses to San Jose State (42–13), BYU (52–13), UTSA (34–27) and #25 Utah State (45–9). In May 2013, Akey filed a lawsuit against the University of Idaho administration, seeking money he felt he was owed from the contract extension he received three years earlier. On December 2, 2012, Arkansas offensive coordinator Paul Petrino was named the 34th head football coach of the Idaho Vandals. The younger brother of former Atlanta Falcons and Arkansas and current Louisville head coach Bobby Petrino, Paul Petrino had ties to the Vandals football program, serving as wide receivers coach under John L. Smith from 1992–1994. Reactions to the hiring were overwhelmingly positive. Arkansas athletic director Jeff Long praised Idaho's hiring of Paul Petrino, saying he would have named Petrino the Arkansas head coach in April 2012 if not for his last name. (Paul's brother, Bobby, was fired due to a scandal stemming from an extramarital affair and John L. Smith was hired instead). A Montana native, Paul Petrino returned to Moscow with a reputation as an offensive mastermind, overseeing a Razorback offense that was among the most explosive in the country and sent a number of players into the National Football League. Petrino, who had no prior head coaching experience, also served as an assistant coach at Utah State (wide receivers/running backs coach/special teams coordinator, 1995–1997), Louisville (wide receivers coach, 1998–1999; offensive coordinator/wide receivers coach, 2003–2006), Southern Miss (quarterbacks coach, 2000–2002), the NFL's Atlanta Falcons (wide receivers coach, 2007) and Illinois (offensive coordinator/wide receivers coach, 2010–2011) during his career. He served as offensive coordinator under both his brother (2008–2009) and former Vandals head coach John L. Smith (2012) at Arkansas. Paul Petrino had extensive recruiting ties in the Rocky Mountain region and Southern United States. Petrino's original five-year contract paid him an base salary of $390,000 annually. On March 27, 2013, it was announced that the University of Idaho would rejoin the Sun Belt Conference as a football-only member with all other sports rejoining the Big Sky Conference effective July 1, 2014. The move came after the Western Athletic Conference dropped football as a conference sport following the 2012 season. The Vandals finished 1–11 in 2013, Idaho's one year as an independent between the end of the Western Athletic Conference and the program's return to the Sun Belt Conference. The Petrino era began on August 31, with a 40–6 loss to North Texas. Next came losses to Wyoming by a score of 42–10, Northern Illinois by a margin of 45–35 and rival Washington State in a 42–0 shutout. The Vandals earned their first win under Paul Petrino with a 26–24 victory over Temple on September 28. The next week, Petrino's team got squashed by #23 Fresno State to the tune of 61–14. That was followed by a 48–24 loss to Arkansas State on October 12. On October 26, the Vandals were pummeled by Ole Miss by a margin of 59–14. Next came a 37–21 loss to Texas State and a 59–38 loss to FCS opponent Old Dominion. An 80–14 pounding from eventual national champion Florida State preceded a more competitive 24–16 loss to New Mexico State in the season's last game. The Vandals went 1–10 in 2014, its first year back in the Sun Belt Conference. Their season opener against Florida was canceled after the opening kickoff due to inclement weather, however, Idaho still received the $975,000 in the agreement with Florida to play the game in Gainesville, Florida. Instead, the Vandals' first game of the season took place on September 6, a 38–31 loss to Louisiana-Monroe. On September 13, Petrino's Vandals lost to Western Michigan by a score of 45–33. That was followed by a 36–24 loss to Ohio on September 20. Losses to South Alabama (34–10), Texas State (35–30) and Georgia Southern (47–24) followed before the Vandals finally picked up their first win of the season with a 29–17 victory over New Mexico State, snapping a thirteen-game losing streak dating back to the previous season. On November 1, Idaho lost to Arkansas State by a margin of 44–28. Next, the Vandals lost to San Diego State by a count of 35–21. Idaho finished the season with a 34–17 defeat at the hands of Troy on November 15 and a 45–28 loss to Appalachian State on November 29. In August 2015, after a team practice a few weeks prior to the start of the 2015 season, Paul Petrino angrily confronted a newspaper reporter who he felt unfairly criticized his team's offense. Facing accusations that he threatened the reporter and had to be physically restrained by an assistant coach, Petrino downplayed the incident and denied he threatened or even "came within seven yards of" the reporter. However, he did admit to "reacting poorly" and "using an unprofessional tone" and apologized in a joint press conference with athletics director Rob Spear. In 2015, the Vandals improved to a 4–8 record. They began the season with a 45–28 loss to Ohio on September 3 and a 59–9 loss to #8 USC on September 12. Petrino's squad recorded their first win of the season in the season's third game with a 41–38 win over FCS opponent Wofford. After losing their next two to Georgia Southern and Arkansas State, the Vandals defeated Troy by a score of 19–16 and Louisiana-Monroe by a score of 27–13. Idaho then lost their next four to New Mexico State (55–48 in OT), South Alabama (52–45), Appalachian State (47–20) and Auburn (56–34). The Vandals finished the season on a strong note, defeating Texas State by a score of 38–31 in the regular season finale on November 28. After the 2015 season, Paul Petrino declined an offer to join his brother Bobby's staff at Louisville as offensive coordinator/associate head coach, a position Paul held from 2003–2006 during Bobby Petrino's first stint as Louisville's head coach. On April 26, 2016, it was announced that starting in 2018, the Vandals will return to the Big Sky Conference and FCS, becoming the first school to leave the FBS for the FCS. The university made the decision after it was informed by the Sun Belt Conference that it won't be retained as a member beyond the 2017 season. On June 17, 2016, it was announced that University of Idaho administration signed Paul Petrino to a raise and three-year contract extension through the 2020 season. In 2016, the Vandals improved again to 9–4 and finished in a tie for third place in the Sun Belt. The nine wins were the most in a single season for the Vandals since 1998. Idaho kicked off the season with a 20–17 win over FCS opponent Montana State. They then lost their next two to #8 Washington (59–14) and Washington State (56–6). Petrino's team earned their first win of the season with a 33–30 overtime win over UNLV on September 24. The Vandals followed that with a 34–13 loss to Troy. Idaho rebounded to win their next two; beating Louisiana-Monroe by a score of 34–31 and New Mexico State by a score of 55–23. After losing to Appalchian State by a score of 37–19, the Vandals won their next four to close the regular season; topping Louisiana–Lafayette by a score of 23–13, Texas State by a score of 47–14, South Alabama by a score of 38–31 and Georgia State by a score of 37–12. They received an invitation to the 2016 Famous Idaho Potato Bowl where they defeated Colorado State by a score of 61–50, with the teams setting a record for most combined points scored in the bowl game. The Idaho Vandals also set the bowl game's record for most total offensive yardage with 606. After the 2016 season, following Jeff Brohm's departure to Purdue, Paul Petrino was mentioned as a possible candidate for the Western Kentucky head coaching position and even spoke to WKU athletics director Todd Stewart about the position, which was held by his brother Bobby for one season in 2013. However, the position eventually went to Mike Sanford Jr.
Idaho went 4–8 in 2017. They began the season on August 23 with a 28–6 victory over FCS opponent Sacramento State. After a 44–16 loss to UNLV and a 37–28 defeat at the hands of Western Michigan, the Vandals defeated South Alabama by a margin of 29–23 in double overtime. On October 7, Petrino's team lost to Louisiana-Lafayette by a score of 21–16. Another close conference loss followed in the next game in the form of a 23–20 loss to Appalachian State after blowing a 20–0 lead. On October 21, the Vandals were obliterated by Missouri in a 68–21 rout. One week later, Petrino's Idaho team recorded its third win of the season with a 31–23 win over Louisiana-Monroe. After a 24–21 loss to Troy, Idaho lost to Coastal Carolina by a score of 13–7. After a 17–10 loss to New Mexico State, the Vandals concluded the season and its tenure in FBS play on December 2 with a 24–10 victory over Georgia State. Idaho rejoined the Sun Belt Conference in 2014 after a season as an independent in 2013, and eight seasons in the Western Athletic Conference (WAC), which dropped football after the 2012 season. The Vandals were previously in the Sun Belt (also football only) from 2001 through 2004, after the Big West Conference dropped football. The Idaho football program began competing 126 years ago in 1893, and was a member of the Pacific Coast Conference from 1922 to 1958. It was then an independent until 1965, when it began league play in the Big Sky Conference. At the time, the other four football programs in the conference were members of the College Division (today's Division II), while Idaho remained a member of the University Division (today's Division I) through 1977, except for an involuntary demotion for 1967 and 1968. It maintained its status by playing a majority of games against University Division opponents. A charter member of the Big Sky in 1963, Idaho did not participate in league play for football until 1965, the Big Sky's third year, after the conference demanded it. With its upper division status, the Vandals were ineligible for the College Division (D-II) playoffs. Notably, in 1971, the Vandals won their first outright conference title in school history. However, runner-up Boise State received the Big Sky's automatic berth. Because of its hybrid status, Idaho requested to retain its higher allotment of football scholarships (75) than the other conference members (62), which was expectedly disallowed. The university received an invitation in 1973 to join the Pacific Coast Athletic Association (later the Big West), but the state board of education (concurrent board of regents) rejected it by a vote of 4 to 3. The Big Sky moved up to the new Division I-AA in 1978 (while Idaho moved down). Idaho experienced its best years in football from 1985 to 1995, when it made the I-AA national playoffs in ten of eleven seasons with four different head coaches, reaching the semifinals twice. After 18 years in Division I-AA, Idaho returned to Division I-A competition (now called the FBS) in 1996 in the Big West. On August 18, 2012, Idaho was cleared to stay in the Football Bowl Subdivision as an independent after the WAC announced it would drop football effective with the end of the 2012 season. Idaho would only remain a football independent for the 2013 season; on March 27 of that year, the Sun Belt Conference announced that Idaho would return as a football-only member starting with the 2014 season. Nearly two years later in 2016, the Sun Belt Conference announced via teleconference that neither the University of Idaho nor New Mexico State University would be renewed after the 2017 football season. In 2018, Idaho resumed full membership in the Big Sky Conference, which participates in the Football Championship Subdivision. The Vandals have won eleven conference championships in their history, nine in the Big Sky. For 18 seasons (1978–95), Idaho was a member of Division I-AA (now FCS), and participated in the I-AA playoffs eleven times to compile a 6–11 playoff record. The Vandals were 4–4 at home and 2–7 on the road, with a 4–7 record in the first round (2–4 at home, 2–3 away). The best advancements were to the national semifinals in 1988 and 1993, but both seasons ended with road losses by large margins to the eventual national champions. The 1982 and 1990 teams advanced to the quarterfinals, but both lost close road games to the eventual national champions. In their time in the NCAA Division I Football Bowl Subdivision (FBS), Idaho participated in three bowl games. The Vandals had a 3–0 record. 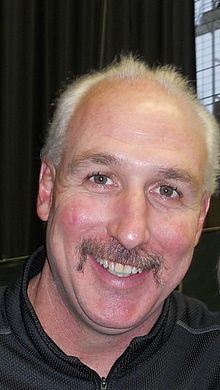 ^ Interim head coach – Gesser coached the final four games of 2012 after Akey was relieved on October 21. The University of Idaho enjoys an in-state rivalry with Boise State University. The Boise State – Idaho rivalry began with a Bronco victory in the first meeting in 1971. They met every year through 2010, and with the exception of four years, (2001–2004), the matchup was a conference game. The rivalry was dominated by streaks as Idaho won 12 straight years from 1982–1993, while Boise State won the most recent 12 games between 1999–2010, mostly by large margins. BSU leads the rivalry with a series record of 22–17–1 (.563). Since Boise State's move to the Mountain West Conference in 2011, Boise State has refused to play Idaho home and home in football. In response, Idaho has refused to play Boise State at Taco Bell Arena for men's basketball. As of 2017, no future games for football or men's basketball are currently scheduled. To add a humorous and somewhat frivolous twist to the rivalry, current Idaho athletics director Rob Spear refused to board a Horizon Air flight on November 11, 2009 after learning the plane bore Boise State's blue and orange colors. The University of Idaho enjoys another in-state rivalry with Idaho State University. Known as the Battle of the Domes, the rivalry was at its most competitive in the 1970s and 1980s, with neither team three-peating; the most recent conference game was in 1995, ISU's last win. Idaho has won eleven of the last twelve and leads the overall series at 28–11 (.718). The last meeting was in 2008, but the series will be revived in 2018 when Idaho drops back to FCS and rejoins the Big Sky Conference in football (its other sports rejoined in 2014). The "Battle of the Domes" theme began in 2017, and is applied to multiple sports. Idaho State was the first of the pair to play its home games indoors, opening the Holt Arena (originally ASISU Minidome) 49 years ago in 1970. The Kibbie Dome in Moscow was enclosed in 1975, after four years as an outdoor venue; the last two outdoor games in this series were played there in 1971 and 1973, then known as new Idaho Stadium. In opposite regions of Idaho and in different time zones, the driving distance between the campuses is over 530 miles (850 km), and further if routed through western Montana. The University of Idaho also enjoys a rivalry with the University of Montana. Known as the Little Brown Stein game, Idaho and Montana first played 116 years ago in 1903 and have played 84 times, and the stein was introduced 81 years ago in 1938, at the 25th meeting. Idaho has dominated the overall series 55–27–2 (.667), which also includes two Division I-AA playoff wins at home in the 1980s. Montana has had the upper hand since 1991, winning eight of the last ten. Since Idaho moved back up to Division I-A in 1996, the teams have met five times, with Montana winning the last four. The schools were the only public universities in their respective states for decades, and are about 200 miles (320 km) apart; Moscow and Missoula are on opposite sides of the lower Idaho Panhandle, separated by the Bitterroot Mountains over Lolo Pass. Both were members of the old Pacific Coast Conference (the forerunner of today's Pac-12); Montana departed after the 1949 season, and the PCC disbanded in the summer of 1959. The universities were charter members of the Big Sky Conference in 1963, (although Idaho remained an independent in football until 1965) and their final season as conference opponents was in 1995. While Montana has been in the Big Sky since its inception, Idaho has changed its conference affiliation no fewer than five times since 1995: Idaho moved to the Big West for all sports in 1996, returning to Division I-A after 18 years in I-AA. After the 2000 season, the Big West dropped football. Idaho became a football-only member of the Sun Belt Conference in 2001 while remaining a full Big West member. Idaho joined the WAC for all sports in 2005 as part of a major NCAA conference realignment. After the WAC experienced a near-complete membership turnover in the early 2010s, it dropped football after the 2012 season. Idaho football was an FBS independent for one season in 2013, then returned to the Big Sky in 2014 except for football, which rejoined the Sun Belt. Idaho will drop back to FCS in 2018 and resume football membership in the Big Sky. Known as the Battle of the Palouse, the first football game between the University of Idaho and Washington State University was played in November 1894 and resulted in a win for Washington State. The game in 1898 was not played because Idaho had an ineligible ringer from Lapwai, F.J. McFarland, a recent All-American from Carlisle. The Vandals' first-ever forward pass was attempted against the Cougars in 1907: it was completed for a touchdown from a drop-kick formation in the fourth quarter and led to a 5–4 victory. Washington State has dominated the local rivalry, holding a 72–16–3 lead. The record since 1926 is even more dominant, with a 57–5–2 advantage for the Cougars. The longest winning streak for Idaho was three games (1923–1925), and has only five victories since that three-peat (1954, 1964, 1965, 1999, & 2000) and two ties (1927, 1950) to offset the 56 losses. The games were skipped in 1969 and 1971, which was unfortunate for Idaho as the 1971 Vandals posted one of the best records (8–3) in school history, while WSU was 4–7. The rivalry became increasingly one-sided as WSU dominated in the 1970s (except for 1974) and the original series ended, following the 1978 game. From 1979 to 1997, the game was played just twice (1982, and 1989) until the 10-year renewal from 1998–2007. Since their last wins in 1999 and 2000, Idaho has been physically outmatched in most of the nine games; the game has been played twice since 2007: in 2013 and 2016. As two schools are in close proximity, from 1938 to 1968 there was a tradition called The Loser's Walk, where during the week following the game students of the losing school would walk from their own campus to the winners' campus, then receive rides back home from the winning side. This has frequently been misreported as students walking back to their own campus immediately following the game. In 1954, the walk made national news when about 2,000 students from Washington State College made the trek east from Pullman to Moscow after the Cougars lost to Idaho for the first time in 29 years. In a span of less than five months, from November 1969 to April 1970, both schools' aged wooden stadiums (Idaho's Neale Stadium and WSU's Rogers Field) burned down due to suspected arson. The WSU–Idaho game in 1970 was dubbed the Displaced Bowl, which was held in Joe Albi Stadium in Spokane on September 19. The Cougars won the game (their only win that season), as well as the next ten against the Vandals. The 1970 game was the first in the rivalry played on AstroTurf, which was new to Joe Albi that season. In 1978, the NCAA split Division I football in two: I-A (now FBS) and I-AA (now FCS). Washington State was in Division I-A as part of the Pac-10 Conference and Idaho downgraded to I-AA as part of the Big Sky Conference, whose other football members moved up from Division II. In the late 1970s, I-A football programs were allowed 50% more scholarships and twice as many assistant coaches as I-AA teams. During the years they were in different divisions, the schools met only twice, 1982 in Spokane and 1989 in Pullman. In 1996, Idaho moved back up to Division I-A in the Big West Conference, and Idaho and WSU rekindled their century-old rivalry. Since the rivalry was reinstated in 1998, every game has been played at Martin Stadium in Pullman, except for the matchup in 2003, which was played at Seattle's Seahawks Stadium. The last game played on the Idaho side of the border was in 1966, a come-from-behind 14–7 Cougar victory on a very muddy field to prevent a Vandal three-peat. After ten years of the renewed rivalry, Vandals head coach Robb Akey, previously WSU's defensive coordinator, said in 2008 that he preferred the game not be played every year, instead saying he would prefer it as a "once-in-a-while thing." Only one game was played during Akey's tenure, in his first season in 2007, and he was fired in October 2012. The meeting in 2013 on September 21 was a one-year revival, but the future of the series under current Vandal head coach Paul Petrino is unclear; WSU won 56–6 in 2016. The next meeting is scheduled for 2020 in Pullman, and Idaho returns to the Football Championship Subdivision and the Big Sky Conference in 2018. Benson Mayowa – defensive end for the Dallas Cowboys (2016–present), Oakland Raiders (2014–15), Seattle Seahawks (2013), including Super Bowl XLVIII. Ray McDonald – 13th overall pick in 1967 draft, running back for the Washington Redskins, 1967–68. Jeff Robinson – 1993–2009, Broncos, Rams, Cowboys, Rams, Seahawks. Super Bowl Champion in Super Bowl XXXIV (Rams). Jake Scott – guard for the Philadelphia Eagles (2012), Tennessee Titans (2008–11), Indianapolis Colts (2004–07), including Super Bowl XLI. Marvin Washington – defensive end (1989–1999) for Jets, 49ers, Broncos. Super Bowl Champion (XXXIII, Broncos). Announced schedules as of February 1, 2016. However, with their drop to FCS beginning in 2018, all games are subject to change. ^ "Trademarks & Licensing". Idaho Vandals Athletics Department. July 13, 2016. Retrieved April 19, 2019. ^ "Kibbie Dome". IdahoPTV. Archived from the original on July 18, 2011. Retrieved December 23, 2010. ^ a b "Idaho Historical Data". College Football Data Warehouse. Archived from the original on February 22, 2015. Retrieved January 20, 2015. ^ "Football Bowl Subdivision Records". NCAA. p. 66. Retrieved September 2, 2011. ^ a b "Idaho Bowl History". College Football Data Warehouse. Archived from the original on December 5, 2010. Retrieved December 23, 2010. ^ "Idaho to be 1st school to drop from FBS to FCS". ESPN. Retrieved May 23, 2017. ^ "Across the Cougar sideline: Scouting the Idaho Vandals – KSL.com". ksl.com. Retrieved October 15, 2017. ^ "The Story of Joe Vandal". ^ a b Roberts, Drew. "Boise State-Idaho: Know Your Enemy". bleacherreport.com. Retrieved October 15, 2017. ^ Finn, Mike; Leistikow, Chad (October 15, 1998). "Hawkeye Legends, Lists, & Lore". Sports Publishing LLC. Retrieved October 15, 2017 – via Google Books. ^ a b "WSU-Idaho series has sparkling past". Lewiston Morning Tribune. Idaho. October 22, 1959. p. 13. ^ Association, National Collegiate Athletic (October 15, 2017). "The Official National Collegiate Athletic Association Football Guide". NCAA Publishing Service. Retrieved October 15, 2017 – via Google Books. ^ "Kelley quits as Idaho coach; will go to U. of Missouri". Spokane Daily Chronicle. Washington. June 8, 1922. p. 24. ^ "Thomas Kelley". saturdaydownsouth.com. August 15, 2014. Retrieved October 15, 2017. ^ "Pacific Coast Conference". si.com. Retrieved October 15, 2017. ^ "IDAHO vs. USC –The 1920s Series (Part II)". scout.com. Retrieved October 15, 2017. ^ "University of Idaho Vandals Athletics". www.govandals.com. Retrieved October 15, 2017. ^ "Charles Erb's Obituary on San Francisco Chronicle". San Francisco Chronicle. Retrieved October 15, 2017. ^ "Most Valuable Players". January 2, 2000. Retrieved October 15, 2017 – via LA Times. ^ Fulop, Dan (June 30, 2012). "Bob Breitbard: San Diego's Sports Keeper". Author House. Retrieved October 15, 2017 – via Google Books. ^ "The Michigan Alumnus". UM Libraries. October 15, 2017. Retrieved October 15, 2017 – via Google Books. ^ "June 3, 2017 Rest in Peace Ted Bank! – Big Blue Football History". bigbluefootballhistory.com. June 3, 2017. Retrieved October 15, 2017. ^ "The Rattle of Theta Chi". Theta Chi Fraternity Inc. October 15, 2017. Retrieved October 15, 2017 – via Google Books. ^ "Spokane Daily Chronicle – Google News Archive Search". news.google.com. ^ "Rumor Says Ted Bank of Idaho Amongst List of Possible Successors to Kipke at Michigan: Vandal Eleven's Pilot Is Silent Regarding Situation". Spokane Daily Chronicle. December 13, 1937. ^ "Bank Slated for Michigan Post". Eugene Register-Guard. December 14, 1937. ^ "Ted Bank Denies He Is Seeking Kipke's Post: Not In The Running Says Harry's Team Mate". The Evening News. Sault Ste. Marie, Michigan. December 15, 1937. ^ "Bank Stays at Idaho". Los Angeles Times. AP. January 11, 1938. ^ "Football". Gem of the Mountains, University of Idaho yearbook. 1939. p. 300. ^ "1938 Idaho". College Football Data Warehouse. ^ "Vandals gridders are happy, but –". Spokane Daily Chronicle. Washington. November 25, 1963. p. 16. ^ "Hall of Fame – University of Idaho Vandals Athletics". www.govandals.com. Retrieved October 15, 2017. ^ "Idaho Yearly Totals". College Football Data Warehouse. Archived from the original on February 16, 2010. ^ "Theodore P. "Ted" Bank Records by Year". College Football Data Warehouse. ^ "Report Has Idaho Gridiron Coach and Aide On Way Out: Bank, Tessier List for Ax in Big Upheaval". Spokane Daily Chronicle. January 17, 1941. ^ "Two Big Universities Eye Ted Bank for Coaching Position: Fired Idaho Mentor in line for East, Midwest Posts". Spokane Daily Chronicle. January 20, 1941. ^ "Ted Bank Fired by Idaho U." Los Angeles Times. AP. January 19, 1941. ^ "Francis Schmidt, formerly of Ohio State, is chosen head football coach at Idaho". Lewiston Morning Tribune. Idaho. Associated Press. March 17, 1941. p. 6. ^ "Vandal coaches". Gem of the Mountains, University of Idaho yearbook. 1942. p. 64. ^ "Idaho athletics coaches". Gem of the Mountains, University of Idaho yearbook. 1943. p. 230. ^ "Idaho, Washington State, and O.S.C. withdraw from Northern Division football loop". Lewiston Morning Tribune. Idaho. Associated Press. September 24, 1943. p. 8. ^ "Francis Schmidt dies in Spokane". Toledo Blade. Ohio. INS. September 20, 1944. p. 16. Retrieved May 1, 2012. ^ "Coach Schmidt dead, Spokane". Lewiston Morning Tribune. Idaho. Associated Press. September 20, 1944. p. 7. Retrieved May 1, 2012. ^ "Coach Schmidt of Idaho dies". Spokesman-Review. Spokane, Washington. September 20, 1944. p. 10. ^ "Howell signed by Idaho U." Tuscaloosa News. Alabama. Associated Press. February 27, 1947. p. 9. ^ "Football (fall 1947)". Gem of the Mountains. University of Idaho yearbook. 1948. pp. 282–294. ^ "Albany Democrat-Herald from Albany, Oregon on November 6, 1947 · Page 12". newspapers.com. Retrieved October 15, 2017. ^ Migdol, Gary (October 15, 1997). "Stanford: Home of Champions". Sports Publishing LLC. Retrieved October 15, 2017 – via Google Books. ^ "1947 Stanford Cardinal Schedule and Results - College Football at Sports-Reference.com". College Football at Sports-Reference.com. Retrieved October 15, 2017. ^ "1928 – UCLA Enters the League". wordpress.com. March 20, 2012. Retrieved October 15, 2017. ^ "The Ogden Standard-Examiner from Ogden, Utah on November 16, 1947 · Page 16". newspapers.com. Retrieved October 15, 2017. ^ "Cougars claw Idaho Vandals 7–0". Spokesman-Review. Spokane, Washington. October 5, 1947. p. 1-sports. ^ "Grid fans pack Moscow stadium". Spokane Daily Chronicle. Washington. October 4, 1947. p. 1. ^ "Dixie Howell signs new two-year contract as Idaho football coach". Lewiston Morning Tribune. Idaho. April 28, 1948. p. 8. ^ "Dixie Howell signs new Idaho contract". Spokane Daily Chronicle. Washington. April 27, 1948. p. 21. ^ "1948 Idaho Vandals Schedule and Results - College Football at Sports-Reference.com". College Football at Sports-Reference.com. Retrieved October 15, 2017. ^ "Action in pictures of Idaho's valiant losing battle against Oregon". Spokesman-Review. Spokane, Washington. October 10, 1948. p. 3-sports. ^ "Report says Howell under fire". Lewiston Morning Tribune. Idaho. Associated Press. April 8, 1950. p. 8. ^ "1949 Idaho Vandals Schedule and Results - College Football at Sports-Reference.com". College Football at Sports-Reference.com. Retrieved October 15, 2017. ^ "Idaho – 1945–49". College Football Data Warehouse. yearly results. Archived from the original on October 8, 2012. Retrieved October 20, 2014. ^ "Howell denies he will leave Idaho grid job". Spokane Daily Chronicle. (Washington). April 18, 1950. p. 17. ^ "Dixie Howell resigns as Idaho football coach". Spokane Daily Chronicle. (Washington). March 27, 1951. p. 21. ^ "1952 Gem of the Mountains, Volume 50 – University of Idaho Yearbook". issuu.com. Retrieved October 15, 2017. ^ "Idaho selects Curfman as coach". Spokesman-Review. (Spokane, Washington). April 17, 1951. p. 14. ^ "Salary of $9000 set for Stahley". Spokane Daily Chronicle. (Washington). United Press. February 23, 1954. p. 16. ^ "Vandal gridders rated too 'pure'". Eugene Register-Guard. (Oregon). Associated Press. October 20, 1953. p. 3B. ^ "Curfman and three aides resign posts at Idaho". Spokane Daily Chronicle. (Washington). December 21, 1953. p. 21. ^ "'Circumstances' force Curfman's resignation". Spokesman-Review. Spokane, Washington. December 22, 1953. p. 12. ^ a b "Idaho plans thorough search for coach; Curfman out". Spokane Daily Chronicle. (Washington). December 22, 1953. p. 12. ^ "Stahley chosen Idaho grid pilot". Spokesman-Review. Spokane, Washington. February 2, 1954. p. 10. ^ "Skip Stahley named Idaho grid mentor". Ellensburg Daily Record. Washington. Associated Press. February 12, 1954. p. 6. ^ "Stahley seeking three assistants; new Idaho coach to get free hand". Spokane Daily Chronicle. Washington. February 12, 1954. p. 10. ^ "O.K. Stahley's $9,000 salary". Ellensburg Daily Record. Washington. Associated Press. February 23, 1954. p. 8. ^ "Idaho regents meet in January; Babe Curfman position unsettled". Spokane Daily Chronicle. Idaho. November 23, 1953. p. 15. ^ "Curfman and three aides resign posts at Idaho". Spokane Daily Chronicle. Washington. December 21, 1953. p. 21. ^ Missildine, Harry (May 24, 1964). "Stahley's departure conjures memories". Spokesman-Review. (Spokane, Washington). p. 1-sports. ^ "Former Idaho coach dies". Moscow-Pullman Daily News. (Idaho-Washington). July 2, 1992. p. 1C. ^ Boni, Bill (October 24, 1954). "Idaho thumps WSC, 10–0". Spokesman-Review. (Spokane, Washington). p. 1-sports. ^ ""Win made us ballclub", says Skip Stahley". Spokane Daily Chronicle. (Washington). October 25, 1954. p. 17. ^ "The March on Moscow". Life. November 15, 1954. p. 63. ^ "Vandals win fourth in a row". Spokesman-Review. Spokane, Washington. Associated Press. November 21, 1954. p. 1-sports. ^ "Stahley is satisfied with Vandals' season". Spokane Daily Chronicle. Washington. November 22, 1954. p. 17. ^ "College Football: Idaho's future murky as WAC era closes". ^ Missildine, Harry (October 25, 1964). "Thunder Ray leads Idaho's charge". Spokesman-Review. Spokane, Washington. p. 1-sports. ^ "Stahley new Idaho "A.D." in addition to grid post". Spokesman-Review. Spokane, Washington. March 22, 1960. p. 13. ^ "Idaho regents drop Stahley from grid post". Spokesman-Review. Spokane, Washington. January 15, 1962. p. 10. ^ "Idaho fires grid coach Skip Stahley". Eugene Register-Guard. Oregon. UPI. January 15, 1962. p. 2B. ^ Carter, Jack (February 18, 1962). "Illinois aide Dee Andros named Idaho football coach". Lewiston Morning Tribune. (Idaho). p. 8. ^ Missildine, Harry (February 18, 1962). "Former Sooner guard new Idaho coach". Spokesman-Review. (Spokane, Washington). p. 1-sports. ^ "New Vandal coach". Spokane Daily Chronicle. (Washington). (photo). February 19, 1962. p. 11. ^ "ISC coaches lodge complaint: Idaho's salaries reported higher". Spokane Daily Chronicle. (Washington). Associated Press. April 21, 1962. p. 10. ^ Teaford, Elliott (October 23, 2003). "Dee Andros, 79; Was Football Coach at Oregon State". Retrieved October 15, 2017 – via LA Times. ^ Payne, Bob (November 18, 1962). "Dee is happy he took job; --"These are great kids"". Spokesman-Review. Spokane, Washington. p. 2-sports. ^ Payne, Bob (November 17, 1963). "Idaho wins; Ford leads Cougars". Spokesman-Review. (Spokane, Washington). p. 1-sports. ^ "Naccarato 'Hec' winner for Vandals". Spokesman-Review. Spokane, Washington. November 27, 1963. p. 12. ^ Johnson, Bob (February 1, 1965). "Dee Andros named Oregon State grid coach". Spokane Daily Chronicle. (Washington). p. 15. ^ "Idaho contest is postponed". Spokane Daily Chronicle. Washington. November 23, 1963. p. 10. ^ "Vandal gridders are happy, but--". Spokane Daily Chronicle. Washington. November 25, 1963. p. 16. ^ "1964 Idaho Vandals Schedule and Results - College Football at Sports-Reference.com". College Football at Sports-Reference.com. Retrieved October 15, 2017. ^ "OSU tips Vandals on punt return tally". Lewiston Morning Tribune. (Idaho). October 19, 1964. p. 11. ^ Missildine, Harry (October 25, 1964). "'Thunder Ray' leads Idaho's charge". Spokesman-Review. Spokane, Washington. p. 1-sports. ^ "Former WSU coach Bert Clark dies". December 17, 2004. ^ "Big Sky Conference – Idaho is the Big Sky's Newest Member". bigskyconf.com. Retrieved October 15, 2017. ^ "Idaho's football membership in the Sun Belt will end in 2017". idahostatesman.com. Retrieved October 15, 2017. ^ a b "Idaho State Journal from Pocatello, Idaho on November 17, 1966 · Page 10". newspapers.com. Retrieved October 15, 2017. ^ "Dee Andros Coaching Record". College Football at Sports-Reference.com. ^ "Idaho State Journal from Pocatello, Idaho on February 3, 1965 · Page 6". ^ "What happened to Ray McDonald, Washington's first-round draft pick in 1967?". si.com. Retrieved October 15, 2017. ^ "1965 Idaho Vandals Schedule and Results - College Football at Sports-Reference.com". College Football at Sports-Reference.com. ^ "UI Football Moving to the Big Sky". www.uidaho.edu. Retrieved October 15, 2017. ^ "2015 University of Idaho Vandal Football Yearbook". issuu.com. Retrieved October 15, 2017. ^ "1965 Idaho Vandals Schedule and Results - College Football at Sports-Reference.com". College Football at Sports-Reference.com. Retrieved October 15, 2017. ^ "1966 Idaho Vandals Schedule and Results - College Football at Sports-Reference.com". College Football at Sports-Reference.com. Retrieved October 15, 2017. ^ "1967 Idaho Vandals Schedule and Results - College Football at Sports-Reference.com". College Football at Sports-Reference.com. Retrieved October 15, 2017. ^ "1967 Idaho Vandals Schedule and Results - College Football at Sports-Reference.com". College Football at Sports-Reference.com. ^ "Steve Musseau Coaching Record". College Football at Sports-Reference.com. ^ "Alums stalk Idaho coach". Deseret News. Salt Lake City, Utah. UPI. November 28, 1967. p. 10B. ^ "Musseau still leaving Idaho: petition ends in dust". The Bulletin. Bend, Oregon. UPI. November 30, 1967. p. 6. ^ "Vandal post goes to Michigan aide". Spokane Daily Chronicle. Washington. January 11, 1968. p. 21. ^ Payne, Bob (January 24, 1968). "The pass is here". Spokesman-Review. (Spokane, Washington). p. 11. ^ "Athletics (1968–69)". Gem of the Mountains. 1969. p. 240. ^ "Steve Olson's future dim". Lewiston Morning Tribune. Idaho. November 4, 1969. p. 10. ^ "Injury-hampered Vandals will face Colorado State". Spokane Daily Chronicle. Washington. November 10, 1969. p. 21. ^ "McNease encouraged". Lewiston Morning Tribune. Idaho. November 23, 1969. p. 12. ^ "Arizona Republic from Phoenix, Arizona on May 16, 1970 · Page 18". newspapers.com. Retrieved October 15, 2017. ^ a b "Robbins to replace McNease at Idaho". Tri-City Herald. Associated Press. May 17, 1970. p. 38. ^ "Idaho officials debating possible coaching change". Lewiston Morning Tribune. Idaho. May 9, 1970. p. 12. ^ "Settlement reached in McNease suit against U of I". Lewiston Morning Tribune. Idaho. June 14, 1973. p. 15. ^ "Settlement approved by McNease". Spokesman-Review. Spokane, Washington. Associated Press. June 13, 1973. p. 15. ^ "Sports – High-school notebook: Troxel, 75, dies of cancer – Seattle Times Newspaper". community.seattletimes.nwsource.com. ^ "Bryce Erickson brings coaching pedigree to Lake City". spokesman.com. Retrieved October 15, 2017. ^ "1976 - Idaho Vandals Football Statistics and Results - Totalfootballstats.com". www.totalfootballstats.com. Retrieved October 15, 2017. ^ "Sports News Briefs". January 10, 1978 – via NYTimes.com. ^ "Jerry Davitch Named Head Football Coach". Bishop McCort Catholic High School. ^ "Jerry Davitch Named Head Football Coach". Bishop McCort Catholic High School. Retrieved October 15, 2017. ^ Emerson, Paul (January 11, 1978). "Davitch named UI coach". Lewiston Morning Tribune. Idaho. p. B1. ^ "Vandal cagers investigated". Spokesman Review. Spokane, Washington. Associated Press. January 12, 1978. p. 25. ^ "Arizona Republic from Phoenix, Arizona on September 27, 1978 · Page 15". newspapers.com. Retrieved October 15, 2017. ^ "1978 - Idaho Vandals Football Statistics and Results - Totalfootballstats.com". www.totalfootballstats.com. Retrieved October 15, 2017. ^ "Were You There? for These Idaho Double-Takes?". sjsuspartans.com. Retrieved October 15, 2017. ^ "mcubed.net : NCAAF Football : Series records : Idaho vs. Washington St". mcubed.net. Retrieved October 15, 2017. ^ "Arizona Republic from Phoenix, Arizona on October 4, 1978 · Page 17". newspapers.com. Retrieved October 15, 2017. ^ "UNLV game at Idaho carries even bigger meaning after Howard loss". reviewjournal.com. September 6, 2017. Retrieved October 15, 2017. ^ a b c "Idaho highlights 2018–19 Big Sky football schedules – University of Montana". www.gogriz.com. ^ a b c "Montana State Bobcats – College Football (NCAA)". michigan-football.com. Retrieved October 15, 2017. ^ a b "Weber State Wildcats – College Football (NCAA)". michigan-football.com. Retrieved October 15, 2017. ^ a b c d e "Broncos-Vandals. Need We Say More?". ^ "Lewiston Morning Tribune – Google News Archive Search". news.google.com. ^ "The Spokesman-Review – Google News Archive Search". news.google.com. ^ Barrows, Bob (November 12, 1978). "No Vandal game, ISU can't make it". Lewiston Morning Tribune. Idaho. p. 1B. ^ "One platoon arrived, one did not – sorry". Spokesman-Review. Spokane, Washington. November 12, 1978. p. C2. ^ "Bengals forfeit to Idaho". Spokesman-Review. Spokane, Washington. November 14, 1978. p. 15. ^ Drosendahl, Glenn (November 12, 1978). "Vandals claim a forfeit". Lewiston Morning Tribune. Idaho. p. 1B. ^ Barrows, Bob (November 11, 1978). "Vandals, Idaho State try to salvage something". Lewiston Morning Tribune. Idaho. p. 3B. ^ "No. 24 Fresno State Prepares For Road Game At Idaho". gobulldogs.com. Retrieved October 15, 2017. ^ "Tim Hundley Returns To UCLA". Pac-12. ^ "1979 - Idaho Vandals Football Statistics and Results - Totalfootballstats.com". www.totalfootballstats.com. ^ "Bulldogs Look to Avoid Another Road Letdown :: Fresno State faces Idaho Vandals in WAC contest". www.cstv.com. ^ "2013 Northern Arizona Football Digital Guide". ^ a b c d e f g h i "Idaho Vandals – College Football (NCAA)". michigan-football.com. ^ a b "Idaho Vandals :: CFB Info". cfbinfo.com. ^ TEGNA. "CSU and the Big 12 football component". ^ a b c "Montana State Bobcats – College Football (NCAA)". michigan-football.com. ^ "Reno Gazette-Journal from Reno, Nevada on November 5, 1979 · Page 16". ^ "Reno Gazette-Journal from Reno, Nevada on November 2, 1979 · Page 43". ^ "South Dakota State Athletics – 1979 Football Schedule". www.gojacks.com. ^ "A family man now". ^ "1980 - Idaho Vandals Football Statistics and Results - Totalfootballstats.com". www.totalfootballstats.com. ^ "Small Colleges". Sports Illustrated: 64. August 31, 1981. ^ "Football: fall 1981". Gem of the Mountains, University of Idaho yearbook. 1982. p. 204. ^ "1981 - Idaho Vandals Football Statistics and Results - Totalfootballstats.com". www.totalfootballstats.com. ^ Emerson, Paul (November 14, 1981). "UI President Gibb says he made decision to fire Davitch". Lewiston Morning Tribune. Idaho. p. 1C. ^ Emerson, Paul (November 13, 1981). "UI fires football coach Jerry Davitch". Lewiston Morning Tribune. Idaho. p. 1C. ^ Emerson, Paul (November 22, 1981). "Idaho bids goodbye to Davitch with loss". Lewiston Morning Tribune. Idaho. p. 2D. ^ "Dennis Erickson hired as Utah's co-offensive coordinator". February 11, 2013. ^ "UtahUtes.com – University of Utah Athletics". www.utahutes.com. ^ "Dennis Erickson to spread out Arizona State's offense". ^ "Keith Gilbertson headlines 52nd Idaho Hall of Fame class". ^ "KSU hires John L. Smith as its new head football coach – Kentucky State University". kysu.edu. ^ a b "Dennis Erickson-Class of 2017". Montana Football Hall of Fame. ^ "1982 - Idaho Vandals Football Statistics and Results - Totalfootballstats.com". www.totalfootballstats.com. Retrieved October 15, 2017. ^ "A family man now". spokesman.com. Retrieved October 15, 2017. ^ Wright, Bart (October 1, 2013). "Football Revolution: The Rise of the Spread Offense and How It Transformed College Football". U of Nebraska Press – via Google Books. ^ "Reno Gazette-Journal from Reno, Nevada on September 20, 1982 · Page 16". ^ "Football to open season against Portland State". August 30, 2010. ^ Wolff, Alexander. "The Week". ^ "University of Montana – 1982 Football Schedule". www.gogriz.com. ^ "Big Sky Conference Roundup". ^ a b "Football Records". ^ Weiskopf, Herm. "THE WEEK". ^ "Homecoming versus Boise State to mark 300th game at Mackay". ^ "EKU's undefeated 1982 football team part of 2017 Hall of Fame induction class". ^ "1983 - Idaho Vandals Football Statistics and Results - Totalfootballstats.com". totalfootballstats.com. ^ Clark, N. Brooks. "The Week". ^ "Bobcat FB Sunday Notebook". Montana State University. ^ a b c d e f "Year by Year Results". ^ "1983 - Eastern Washington Eagles Football Statistics and Results - Totalfootballstats.com". www.totalfootballstats.com. ^ "College Football 1983 Games". www.phys.utk.edu. ^ a b "Weber State Wildcats – College Football (NCAA)". michigan-football.com. ^ "Idaho highlights 2018–19 Big Sky football schedules – University of Montana". www.gogriz.com. ^ "Southern Illinoisan from Carbondale, Illinois on October 31, 1983 · Page 10". ^ "Arizona Republic from Phoenix, Arizona on November 6, 1983 · Page 15". ^ "1984 - Idaho Vandals Football Statistics and Results - Totalfootballstats.com". totalfootballstats.com. ^ Press, Associated (September 15, 1985). "Portland State Beaten, 23–10, by Idaho State" – via LA Times. ^ Conference, Courtesy Big Sky. "Bobcats' 1984 I-AA title capped 30-year run of success". ^ "OSUBeavers.com – Oregon State Athletics". www.osubeavers.com. ^ "Reno Gazette-Journal from Reno, Nevada on October 7, 1984 · Page 25". ^ "Reno Gazette-Journal from Reno, Nevada on November 4, 1984 · Page 21". ^ Neighbor, Fritz. "Fort Lewis sets self up as lesser team". The Missoulian. ^ "The rest of the stories". April 16, 2017. ^ "1985 - Idaho Vandals Football Statistics and Results - Totalfootballstats.com". totalfootballstats.com. ^ "Oregon State to Honor Dave Kragthorpe Led Football Teams". ^ "St. Cloud Times from Saint Cloud, Minnesota on September 5, 1992 · Page 16". ^ "Arizona Daily Star from Tucson, Arizona on September 22, 1985 · Page 45". ^ "Reno Gazette-Journal from Reno, Nevada on October 4, 1985 · Page 23". ^ "Southland Roundup: Hoiness Leads Idaho to Easy Victory Over Portland State, 51–17". October 6, 1985 – via LA Times. ^ "Reno Gazette-Journal from Reno, Nevada on October 19, 1985 · Page 12". ^ a b "Idaho's Defense Zeros In Vandals Overpower Portland State". ^ "Reno Gazette-Journal from Reno, Nevada on October 27, 1985 · Page 28". ^ "Eagles struck right chords in '85 season". ^ Clark, Brooks. "The Agony and The Ecstasy and The Agony of Montana State Football". ^ "Reno Gazette-Journal from Reno, Nevada on November 26, 1985 · Page 11". ^ "No. 16 Eagles meet Idaho in Big Sky clash". web.kitsapsun.com. ^ "Dennis Erickson Coaching Profile – Totalfootballstats.com". www.totalfootballstats.com. Retrieved October 15, 2017. ^ College Football Data Warehouse Archived July 3, 2009, at the Wayback Machine – Idaho opponents – Boise St.
^ "Scott Linehan named inductee to Idaho Athletic Hall of Fame". cbssports.com. Retrieved October 15, 2017. ^ "Seahawks assistant Tom Cable making winning strides with his team, and his perception". seattletimes.com. January 29, 2015. Retrieved October 15, 2017. ^ "John Friesz to College Football Hall of Fame". scout.com. Retrieved October 15, 2017. ^ "Hi-Noon: Bobblehead For Schlereth". spokesman.com. Retrieved October 15, 2017. ^ Newman, Bruce. "Just Call It Erickson U." si.com. Retrieved October 15, 2017. ^ "Wyoming Coach Tall In Saddle". chicagotribune.com. Retrieved October 15, 2017. ^ a b c "Utah assistant, ex-Miami coach Erickson retiring". espn.com. Retrieved October 15, 2017. ^ Boling, Dave (December 6, 1985). "Idaho passes the football to Gilbertson". Spokane Chronicle. Washington. p. C1. ^ "Washington Huskies – University of Washington Athletics". www.gohuskies.com. Retrieved October 15, 2017. ^ "Bill Diedrick Bio". und.com. Retrieved October 15, 2017. ^ "Kent Baer Bio – University of Nevada Las Vegas Official Athletic Site". unlvrebels.com. Retrieved October 15, 2017. ^ "Firing shouldn't hurt recruiting". seattlepi.com. Retrieved October 15, 2017. ^ "The Keith Gilbertson Era: Gilby takes UW dream job". ^ "1986 - Idaho Vandals Football Statistics and Results - Totalfootballstats.com". totalfootballstats.com. Retrieved October 15, 2017. ^ "Detroit Free Press from Detroit, Michigan on September 13, 1986 · Page 31". newspapers.com. Retrieved October 15, 2017. ^ McCURDIE, J. I. M. (September 20, 1986). "Cal State Fullerton, Suddenly Battered, Takes On Idaho". Retrieved October 15, 2017 – via LA Times. ^ "UNLV Libraries Digital Collections: Rebel Yell, 1986-09-23". digital.library.unlv.edu. Retrieved October 15, 2017. ^ a b "Idaho State Athletics – Year by Year Results". www.isubengals.com. Retrieved October 15, 2017. ^ "Reno Gazette-Journal from Reno, Nevada on November 30, 1986 · Page 25". newspapers.com. Retrieved October 15, 2017. ^ "Arizona Daily Star from Tucson, Arizona on October 27, 1986 · Page 10". newspapers.com. Retrieved October 15, 2017. ^ "Mobile – 1986 Football Schedule". www.gogriz.com. Retrieved October 15, 2017. ^ "Big Sky Conference – No. 10 #BigSky50 Greatest Men's Moments – MSU's 1984 Division I-AA National Title". bigskyconf.com. Retrieved October 15, 2017. ^ "Six to Be Inducted in WSU Athletics Hall of Fame". weberstatesports.com. Retrieved October 15, 2017. ^ "Nevada Reno Scores a 27–7 Win Over Idaho in Playoffs". LA Times. November 30, 1986. Retrieved October 15, 2017 – via United Press International. ^ "1987 - Idaho Vandals Football Statistics and Results - Totalfootballstats.com". totalfootballstats.com. Retrieved October 15, 2017. ^ "Idaho Vandals – College Football (NCAA)". michigan-football.com. Retrieved October 15, 2017. ^ "Detroit Free Press". newspapers.com. September 14, 1987. p. 73. Retrieved October 15, 2017. ^ Sullivan, Robert. "College Football". si.com. Retrieved October 15, 2017. ^ "Reno Gazette-Journal from Reno, Nevada on November 13, 1987 · Page 29". newspapers.com. Retrieved October 15, 2017. ^ "Idaho highlights 2018–19 Big Sky football schedules". University of Montana. Retrieved October 15, 2017. ^ "Reno Gazette-Journal from Reno, Nevada on October 18, 1987 · Page 17". newspapers.com. Retrieved October 15, 2017. ^ "Reno Gazette-Journal from Reno, Nevada on October 30, 1987 · Page 27". newspapers.com. Retrieved October 15, 2017. ^ "Reno Gazette-Journal from Reno, Nevada on November 20, 1987 · Page 25". newspapers.com. Retrieved October 15, 2017. ^ "John Friesz passed for 423 yards and four touchdowns..." upi.com. Retrieved October 15, 2017. ^ "1987 football team to be honored". weberstatesports.com. Retrieved October 15, 2017. ^ "1988 - Idaho Vandals Football Statistics and Results - Totalfootballstats.com". totalfootballstats.com. Retrieved October 15, 2017. ^ "The Anniston Star from Anniston, Alabama on November 23, 1988 · Page 10". newspapers.com. Retrieved October 15, 2017. ^ "Archives West: University of Idaho Athletics Vertical File, 1894–2012". archiveswest.orbiscascade.org. Retrieved October 15, 2017. ^ "Reno Gazette-Journal from Reno, Nevada on November 26, 1988 · Page 16". newspapers.com. Retrieved October 15, 2017. ^ "1988 was a disaster". scout.com. Retrieved October 15, 2017. ^ a b "Idaho Vandals :: CFB Info". cfbinfo.com. Retrieved October 15, 2017. ^ "Reno Gazette-Journal from Reno, Nevada on November 6, 1988 · Page 24". newspapers.com. Retrieved October 15, 2017. ^ "Decades of Bronco Stadium Dominance". 247sports.com. Retrieved October 15, 2017. ^ "The Town Talk from Alexandria, Louisiana on November 27, 1988 · Page 30". newspapers.com. Retrieved October 15, 2017. ^ Neighborm, Fritz. "Red Rematch: Grizzlies happy to have another shot at No. 4 Eastern". missoulian.com. Retrieved October 15, 2017. ^ "NSU sets date for 1988 Southland Conference championship team reunion". Northwestern State University. Retrieved October 15, 2017. ^ Kasper, Jon. "Tough schedule prepares Demons for playoffs". missoulian.com. Retrieved October 15, 2017. ^ Group, Sinclair Broadcast. "Greatest Moments – Furman beat fiercest rival for 1988 Division I-AA championship". americansportsnet.com. Retrieved October 15, 2017. ^ "The Times from Shreveport, Louisiana on December 11, 1988 · Page 16". newspapers.com. Retrieved October 15, 2017. ^ Boling, Dave (December 21, 1988). "Gilbertson withdraws". Spokane Chronicle. Washington. p. C1. ^ "Goodbye Gilby". Lewiston Morning Tribune. Idaho. Associated Press. December 24, 1988. p. B1. ^ Meehan, Jim (December 24, 1988). "Official: Gilbertson leaving Vandals to accept Husky post". Idahonian. Moscow. p. 1D. ^ "Former Idaho coach key for Huskies". Ellensburg Daily Record. Washington. Associated Press. December 28, 1990. p. 12. ^ "John L. Smith Bio". Michigan State University. ^ a b "John L. Smith". August 14, 2014. ^ a b c "John L. Smith hired by Kentucky State". ^ "John L. Smith Returns to Big Sky". ^ "Hall of Famers arrive on campus – University of Idaho". Idaho Vandals. ^ "Football Game Notes, Week Two: WSU vs. Idaho". Pac-12. ^ "Portland State Vikings – College Football (NCAA)". michigan-football.com. ^ "Idaho 45, Sacramento St. 3". ^ "At Least Someone From Weber State Won a Ballgame". September 24, 1989. ^ "Idaho highlights 2018–19 Big Sky football schedules". University of Montana. ^ "Idaho 41, N. Arizona 31". ^ "Idaho 41, Montana State 7". ^ "Reno Gazette-Journal from Reno, Nevada on October 31, 1989 · Page 30". ^ "Idaho 26, Boise State 21)". ^ "FCS: Walter Payton Award preseason watch list tabs 22 players, including 2016 winner Jeremiah Briscoe". August 2, 2017. ^ "1990 - Idaho Vandals Football Statistics and Results - Totalfootballstats.com". www.totalfootballstats.com. ^ "Texas State Returns Home To Host Idaho". Texas State. ^ "BYU Takes on San Diego St., U. Hosts 'Bows". September 19, 1990. ^ "Weber State Succumbs to Idaho in Wild, Wooly Offensive Showing". September 23, 1990. ^ "Nevada Wolf Pack – College Football (NCAA)". michigan-football.com. ^ Sahlberg, Bert. "59–21 Win Over Chico St. Marred by Ankle Injury". ^ "Idaho Rolls to a 51–28 Victory". LA Times. October 21, 1990 – via Associated Press. ^ "Arizona Republic from Phoenix, Arizona on November 4, 1990 · Page 19". ^ Read, Don. "Don Read: Travel down memory lane". The Missoulian. ^ "St. Louis Post-Dispatch from St. Louis, Missouri on November 25, 1990 · Page 61". ^ "Georgia Southern 28, Idaho 27". ^ "1991 – Idaho Vandals Football Statistics and Results". totalfootballstats.com. ^ "Idaho looking to Wyoming – University of Idaho". Idaho Vandals. ^ Reed, William F. "College Report". ^ "Reno Gazette-Journal from Reno, Nevada on October 6, 1991 · Page 41". ^ a b "Weber State Learns There's a `D' in Idaho". September 19, 1993. ^ "Eastern Washington University Athletics". goeags.com. ^ "1992 - Idaho Vandals Football Statistics and Results". totalfootballstats.com. ^ "St. Cloud Times from Saint Cloud, Minnesota on September 12, 1992 · Page 16". ^ "Game notes: Rams travel to Idaho". Colorado State University. ^ "Wildcats Aren't Ready to Push Panic Button". September 26, 1992. ^ Munoz, Theresa (October 4, 1992). "CSUN Defense Does Not Rest in 30–7 Loss to Idaho: College football: Sixth-ranked Vandals control the clock and limit Matadors to 41 yards in 33 carries" – via LA Times. ^ Reed, William F. "College Football". ^ Sahlberg, Bert. "Clearcut Rout Lumberjacks Wiped Out by Quick-Striking Vandals 53–14". ^ "Mobile – 1992 Football Schedule". www.gogriz.com. ^ "Montana State Athletics". www.msubobcats.com. ^ "Idaho Turns Bsu Inside-Out Vandals Finally Win Outdoors, Crush Broncos 64–19 In Finale". ^ "McNeese State Edges Big Sky's Idaho, 23–20". November 29, 1992. ^ Sahlberg, Bert. "Cowboys Buck Vandals 23–20 – McNeese State's Field of Dreams Runs Wild for Comeback and Ouster of Fifth-Ranked Idaho". ^ "1993 - Idaho Vandals Football Statistics and Results". totalfootballstats.com. ^ "Majors' 2nd Debut a Success As Pitt Edges Southern Miss". September 3, 1993. ^ Berkowitz, Steve (September 16, 1993). "Football Notebook" – via www.washingtonpost.com. ^ "The Daily Spectrum from Saint George, Utah on October 18, 1993 · 6". ^ "Bobcat History Lesson: 11 Years Ago Today". Montana State University. ^ "University of Montana – 1993 Football Schedule". www.gogriz.com. ^ "Lehigh Gets Scalloped By Idaho 77–14". ^ "Moscow-Pullman Daily News – Google News Archive Search". news.google.com. ^ "Terriers' Perfect Season Succumbs in Idaho, 21–14". New York Times. December 5, 1993. ^ "Youngstown State, Marshall Reach 1-AA Finals". December 12, 1993. ^ "2017 football: Five best Idaho QBs of all-time". ^ "Doug Nussmeier NFL Stats – Season & Career Statistics". www.foxsports.com. ^ "1994 - Idaho Vandals Football Statistics and Results - Totalfootballstats.com". totalfootballstats.com. ^ "Southern Utah Overmatched Against Idaho". September 4, 1994. ^ Kawakami, Tim (September 19, 1994). "Throwing to Him Was No Gamble: College football: Gatewood (23 catches, 363 yards) has record night for fast-breaking UNLV in loss to Idaho" – via LA Times. ^ Sahlberg, Bert. "Sudden turn of fortune; Vandals throttle S.F. Austin in second half". ^ "John L. Smith brings big-time coaching experience to small Fort Lewis". April 20, 2013. ^ "Kentucky State hires former Utah State, Weber State coach John L. Smith to coach Thorobreds". December 7, 2015. ^ "Spartans coach Smith out after season". ESPN.com. November 1, 2006. ^ "John L. Smith won't be back as Arkansas coach". ^ "Board approves Tormey contract". Moscow-Pullman Daily News. Idaho-Washington. March 23, 1995. p. 1D. ^ a b "Washington Huskies". Washington Huskies. ^ "Chris Tormey Coaching Record". College Football at Sports-Reference.com. ^ Sahlberg, Bert. "Idaho says yes to Big West; University will join conference in July of 1996". ^ "1995 - Idaho Vandals Football Statistics and Results - Totalfootballstats.com". www.totalfootballstats.com. Retrieved July 15, 2018. ^ "College Football: Pacific 10 Roundup: Oregon State Unimpressive Against Idaho". Los Angeles Times. September 3, 1995 – via Associated Press. ^ "Hisaw Regains Starting Qb Role For Idaho's Game Against Ewu". ^ "Idaho Blitzes Ewu For 37–10 Sky Win". ^ "Vandals Outleg The Grizzlies Hisaw, Dickenson Have A Field Day As UI Prevails 55–43". ^ "Vandals Lose Two Starters With Injuries". ^ "No Quit In Vandals, Ever". ^ "Vandals Ride Freshman To 16–12 Win". ^ "Idaho States Case; Decision Up To Jury". ^ "Vandals Bow Out Quietly Idaho Proves No Match For Mcneese State, Falls 33–3 In Opening Round Of I-Aa Playoffs". ^ "1996 Idaho Vandals Schedule and Results - College Football at Sports-Reference.com". College Football at Sports-Reference.com. ^ "Wyoming is 2–0 Thanks to Placekicker Wedel". September 10, 1996. ^ "San Diego State Has Fine Performance Against Fien". LA Times. September 8, 1996 – via Associated Press. ^ "Reno Gazette-Journal from Reno, Nevada on November 3, 1996 · Page 49". ^ "UI At Odds With Utah Motel Over Theft Of $800 In Property". ^ "Idaho's Streak On Line Against Former Coach Smith, Who Won Final 9 Home Games At UI, Back With Utah St". ^ "Idaho & NMSU got kicked out of CFB's worst league". ^ "The Paris News from Paris, Texas on November 17, 1996 · Page 12". ^ "Allen Accuses Idaho Of Running Up Score". ^ "1997 Idaho Vandals Schedule and Results - College Football at Sports-Reference.com". College Football at Sports-Reference.com. ^ "Idaho Shifts Gears For Psu Big Sky's Vikings Offer Vandals Sharp Contrast To Opening Foe". ^ sports@idahopress.com, William Love. "Vandals enjoy easy victory". ^ "News-Press from Fort Myers, Florida". November 4, 1997. p. 40. ^ "Aggies face tough schedule, last year at Toomey". UC Davis. ^ "Dutton's Big Day Dumps UI Nevada's Qb, Defense Leave Vandals Reeling". ^ "Utah State romps to big win". September 12, 1999. ^ "Eastern Enjoys Last Laugh Touchdown In Last Minute Worth 24–21 Win Over Vandals At Albi". ^ "Vandals' Offense Rolls Over Nmsu". ^ "Boise Stuns UI In Ot, 30–23 Vandals Can't Hang On After Opening 23–6 Lead Over Broncos". ^ "Idaho Wins Humanitarian Bowl". ^ Meehan, Jim (December 30, 1998). "Idaho looks for huge upset". Spokesman-Review. Spokane, Washington. p. C1. ^ Blanchette, John (December 31, 1998). "Destiny smiles on Idaho". Spokesman-Review. Spokane, Washington. p. C1. ^ Pond, Alex (December 31, 1998). "Vandals win! Vandals win!". Moscow-Pullman Daily News. p. 1A. ^ Pond, Alex (November 23, 1998). "The call to glory". Moscow-Pullman Daily News. Idaho-Washington. p. 1C. ^ "1998 Idaho Vandals Schedule and Results - College Football at Sports-Reference.com". College Football at Sports-Reference.com. ^ "Wyoming Football Welcomes New Coaches – University of Wyoming". www.gowyo.com. ^ Pond, Alex (December 31, 1998). "Vandals victorious: from chumps to champs". Moscow-Pullman Daily News. Idaho-Washington. p. 1C. ^ Meehan, Jim (January 5, 1999). "Tormey interviews at UW". Spokesman-Review. Spokane, Washington. p. C5. ^ Staff, From; Reports, Wire (January 10, 1999). "Neuheisel Leaves Colorado to Take Washington Job" – via LA Times. ^ Pond, Alex (January 23, 1999). "Just happy to be here". Moscow-Pullman Daily News. Idaho-Washington. p. 1D. ^ "Erickson Named Beavers Coach". ^ "1999 Idaho Vandals Schedule and Results - College Football at Sports-Reference.com". College Football at Sports-Reference.com. ^ Kowalick, Vince (September 4, 1999). "Matador Secondary Gets a Boost From Abdul-Malik" – via LA Times. ^ "Auburn 30, Idaho 23". ^ Blanchette, John (September 19, 1999). "Down for the long count". Spokesman-Review. p. C1. ^ Pond, Alex (September 20, 1999). "Vandals rule the Palouse". Moscow-Pullman Daily News. Idaho-Washington. p. 1B. ^ "Battered Cowboys still seeking first win". ^ "North Texas N. Texas/Idaho Idaho College Football recap on ESPN". a.espncdn.com. ^ "Archive—Football preview vs. Idaho". www.hardnewscafe.usu.edu. ^ "USU Football To Travel To UL-Monroe And Face Former Aggie Coach Charlie Weatherbie". ^ "Weekly Game Preview – Boise State (Nov. 13)". New Mexico State University. ^ "Concussion Can't Keep Insley From a Record". LA Times. November 7, 1999 – via Associated Press. ^ Kasper, Jon. "Welsh has strong year despite Vandals' record". The Missoulian=. ^ Meehan, Jim (December 9, 1999). "Tormey accepts Nevada head coach job". Spokesman-Review. Spokane, Washington. p. C1. ^ Pond, Alex (December 9, 1999). "Idaho players understand coach's decision". Moscow-Pullman Daily News. Idaho-Washington. p. 1B. ^ "Vandals gear up for Football 2000". ^ a b "Tom Cable". Seattle Seahawks. Archived from the original on September 25, 2017. Retrieved January 19, 2018. ^ "2000 Idaho Vandals Schedule and Results - College Football at Sports-Reference.com". College Football at Sports-Reference.com. ^ "Idaho Vandals vs. Washington Huskies – Box Score – September 2, 2000". www.foxsports.com. ^ Kasper, Jon. "Griz try to reclaim home turf". Missoulian. ^ "Idaho vs. BCS teams: 1–28 since 2000". ^ "WSU Football Opens 2001 Against Idaho In Battle Of Palouse". Pac-12. ^ Writer, KYLE SAMPLE, Chronicle Sports. "Bobcats, Vandals to play in '16". ^ "Vandals swallow tough loss at WVU". ^ KING, HARRY. "Arkansas State still searching for victory – TheCabin.net". thecabin.net. ^ "North Texas ASU's final hope for victory – TheCabin.net". thecabin.net. ^ "Aggies Drop Double Overtime Heartbreaker to Idaho 38–37". New Mexico State University. ^ "Dirk Koetter Becomes 21st ASU Football Coach". Pac-12. ^ "University of Idaho Approved to Gain Full Membership in the Sun Belt Conference: Vandals have been football-only member since 2001; other sports to follow by 2005 – Sun Belt Conference". sunbeltsports.org. ^ "2001 Idaho Vandals Schedule and Results - College Football at Sports-Reference.com". College Football at Sports-Reference.com. ^ "Vandals Fall to Washington State, 36–7 – Sun Belt Conference". sunbeltsports.org. ^ "'Special' day as the Huskies demolish Idaho, 53–3". ^ "NCAA Football – Boise State vs. Idaho". usatoday30.usatoday.com. ^ "Sportlight". October 6, 2003. ^ "New Mexico State Athletics – 2001 Final Statistics". www.nmstatesports.com. ^ "Louisiana-Lafayette Ragin' Cajuns Schedule – 2001 Team Schedule". www.foxsports.com. ^ "Indians squeeze out 34-31 victory over winless Idaho – TheCabin.net". thecabin.net. ^ Kasper, Jon. "Vandals limp into finale". Missoulian. ^ "Winning Isn't Everything for Fellow Named Frosty". December 2, 2001 – via LA Times. ^ Neighbor, Fritz. "2001 team leaves lasting legacy: National champs inducted into Grizzly Hall of Fame". The Missoulian. ^ "2002 Idaho Vandals Schedule and Results - College Football at Sports-Reference.com". College Football at Sports-Reference.com. ^ "Idaho vs. Boise State – Game Summary – August 31, 2002". ESPN.com. ^ "Idaho hoping to kick WSU off the throne". September 9, 2006. ^ "Idaho vs. Oregon – Game Recap". ESPN.com. September 14, 2002. ^ "San Diego State vs. Idaho – Game Summary – September 21, 2002". ESPN.com. ^ "Washington Huskies – University of Washington Athletics". www.gohuskies.com. ^ "Is the University of Idaho coming to the Big Sky Conference?". March 7, 2016. ^ "Football falls 34–14 at Louisiana-Monroe Boxscore". Idaho Vandals. ^ "MT Loses Heartbreaker to Idaho 21–18". Middle Tennessee State University. ^ "Rekieta Rallies Cajuns Past Vandals For Homecoming Victory". Ragin' Cajuns Athletics. ^ "North Texas 10, Idaho 0". ^ Mills, Tribune/Kyle. "Arkansas St. 38, Idaho 29". ^ "Football loses hard-fought battle with NMSU". Idaho Vandals. ^ "2003 Idaho Vandals Schedule and Results - College Football at Sports-Reference.com". College Football at Sports-Reference.com. ^ "Washington State vs. Idaho – Game Recap". ESPN.com. August 30, 2003. ^ "Vandals approach EWU with caution". ^ "Boise State vs. Idaho – Game Recap". ESPN.com. September 13, 2003. ^ "No. 19 Huskies Romp Idaho 45–14". Pac-12. ^ "Montana facing highest-ranked FBS opponent". ^ "Vandals defeat New Mexico State in Sun Belt opener". ^ "Drupal 6 - Shutdown" (PDF). inthenews.unt.edu. Retrieved July 15, 2018. ^ "2003 Football Schedule". Middle Tennessee State University. ^ "Honolulu Star-Bulletin Sports". archives.starbulletin.com. ^ Turbeville, Kevin. "Arkansas State slips past Idaho 24-23 – TheCabin.net". thecabin.net. ^ "UI romps at Louisiana-Monroe". Idaho Vandals. ^ "Vandals wrap up 2003 season with 20–13 victory over Utah State BOXSCORE". Idaho Vandals. ^ Klein, Gary (December 3, 2003). "Linebacker Coach Holt Talks to Idaho" – via LA Times. ^ "Tom Cable Coaching Record". College Football at Sports-Reference.com. ^ Meehan, Jim (December 9, 2003). "It's official: Holt Idaho's head man". Spokesman-Review. p. C1. ^ "Idaho names USC's Holt head coach". SI.com. Associated Press. December 9, 2003. Retrieved September 8, 2013. ^ "Nick Holt Bio". Purdue Sports. ^ "Bobby Petrino Announces Jeff Brohm as Offensive Coordinator, Nick Holt as Defensive Coordinator". ^ "Idaho coach Holt confirms exit for NFL's Rams". ESPN. Associated Press. February 8, 2006. Retrieved September 8, 2013. ^ "Idaho non-football coaches also look forward to WAC encounters". ^ "2004 Idaho Vandals Schedule and Results - College Football at Sports-Reference.com". College Football at Sports-Reference.com. ^ a b Dvorak, Todd. "Board approves Idaho football going independent" – via Associated Press. ^ "Idaho vs. Boise State – Game Recap". ESPN.com. September 4, 2004. ^ "Sloppy Utah State fends off Vandals". ^ "Washington State vs. Idaho – Game Recap". ESPN.com. September 18, 2004. ^ "Idaho vs. Oregon – Game Recap". ESPN.com. September 25, 2004. ^ "Idaho vs. Eastern Michigan – Game Summary – October 2, 2004". ESPN.com. ^ "University of Idaho Vandals Athletics". www.govandals.com. ^ Dan McDonald, Special to The Advocate. "For homecoming, Cajuns welcome an unfamiliar foe in Idaho". ^ "2004 Football Schedule". Middle Tennessee State University. ^ "Idaho vs. Troy – Game Summary – October 30, 2004". ESPN.com. ^ "Paul Petrino and the Idaho Vandals at A-State – By the Numbers". www.sportinglifearkansas.com. ^ "Thomas leaves no doubts in win over Idaho". ^ "NCAAF College Football Scores – NCAAF Scoreboard". ESPN. ^ Stalwick, Howie (September 22, 2004). "An 'All-American Kid' Is Mourned" – via LA Times. ^ "Brothers sentenced in UI murder". ^ "2005 Idaho Vandals Schedule and Results - College Football at Sports-Reference.com". College Football at Sports-Reference.com. ^ "Idaho vs. Washington State – Game Recap". ESPN.com. September 1, 2005. ^ "Idaho vs. UNLV – Game Recap". ESPN.com. September 10, 2005. ^ "Idaho vs. Washington – Game Recap". ESPN.com. September 17, 2005. ^ "Hawai'i vs. Idaho – Game Recap". ESPN.com. September 24, 2005. ^ "Aggies Lose WAC Opener At Idaho 27–13". ^ "Idaho vs. Nevada – Game Recap". ESPN.com. October 8, 2005. ^ "Fresno State vs. Idaho – Game Recap". ESPN.com. October 22, 2005. ^ "Vandals victorious in thriller". ^ "Louisiana Tech vs. Idaho – Game Recap". ESPN.com. November 12, 2005. ^ "Idaho vs. Boise State – Game Recap". ESPN.com. November 19, 2005. ^ "Idaho vs. San José State – Game Recap". ESPN.com. November 26, 2005. ^ Gary Klein, Opener against Idaho is Holt's legacy, Los Angeles Times, August 27, 2007. ^ Matt Baney, About to renew acquaintances Archived September 28, 2007, at the Wayback Machine, Lewiston Tribune, August 29, 2007. ^ "Nick Holt Coaching Record". College Football at Sports-Reference.com. ^ "Erickson on UI's short list". ^ a b "Idaho hires Erickson as its football coach". February 9, 2006. ^ "Erickson, UI hit the field". ^ "Erickson lines up staff". ^ "2006 Idaho Vandals Schedule and Results - College Football at Sports-Reference.com". College Football at Sports-Reference.com. ^ "Idaho vs. Michigan State – Game Recap". ESPN.com. September 2, 2006. ^ "Idaho vs. Washington State – Game Recap". ESPN.com. September 9, 2006. ^ "Idaho State vs. Idaho – Game Recap". ESPN.com. September 16, 2006. ^ "Erickson, UI corralled in Corvallis". ^ "After Quick Start, Aggies Lose WAC Opener 41–21 To Idaho :: USU jumped out to a 14–0 lead just seven minutes into the game". www.cstv.com. ^ "New Mexico State vs. Idaho – Game Recap". ESPN.com. October 7, 2006. ^ "Vandal football wins at Louisiana Tech". ^ "Boise State vs. Idaho – Game Recap". ESPN.com. October 21, 2006. ^ "Sports". Honolulu Star-Bulletin. October 29, 2006 – via archives.starbulletin.com. ^ "Nevada dismantles Idaho, 45–7". Associated Press. ^ "Idaho vs. Fresno State – Game Recap". ESPN.com. November 18, 2006. ^ "San José State vs. Idaho – Game Recap". ESPN.com. November 25, 2006. ^ "Arizona State Hires Erickson As Coach – washingtonpost.com" – via www.washingtonpost.com. ^ Meehan, Jim (December 21, 2006). "Akey a change of pace". The Spokesman-Review. Spokane, Washington. p. C1. Retrieved April 20, 2012. ^ a b "Robb Akey Biography". ^ "2007 Idaho Vandals Schedule and Results - College Football at Sports-Reference.com". College Football at Sports-Reference.com. ^ "Idaho vs. USC – Game Recap". ESPN.com. September 1, 2007. ^ "Cal Poly vs. Idaho – Game Recap". ESPN.com. September 8, 2007. ^ "Idaho vs. Washington State – Game Recap". ESPN.com. September 15, 2007. ^ "Northern Illinois hangs on to beat Idaho 42-35". usatoday30.usatoday.com. ^ "Hawai'i vs. Idaho – Game Recap". ESPN.com. September 29, 2007. ^ "Idaho vs. San José State – Game Recap". ESPN.com. October 6, 2007. ^ "College Football – Fresno St. vs. Idaho". usatoday30.usatoday.com. ^ "Idaho vs. New Mexico State – Game Recap". ESPN.com. October 20, 2007. ^ "Lippincott Scores Twice to Lead Nevada to 37–21 Win over Idaho". University of Nevada. ^ "Louisiana Tech vs. Idaho – Game Recap". ESPN.com. November 3, 2007. ^ "Idaho vs. Boise State – Game Recap". ESPN.com. November 17, 2007. ^ "Utah State vs. Idaho – Game Recap". ESPN.com. November 24, 2007. ^ "2008 Idaho Vandals Schedule and Results - College Football at Sports-Reference.com". College Football at Sports-Reference.com. ^ "Idaho vs. Arizona – Game Recap". ESPN.com. August 30, 2008. ^ "Idaho State vs. Idaho – Game Recap". ESPN.com. September 6, 2008. ^ "Western Michigan vs. Idaho – Game Summary – September 13, 2008". ESPN.com. ^ "Idaho vs. Utah State – Game Recap". ESPN.com. September 20, 2008. ^ "Idaho vs. San Diego State – Game Recap". ESPN.com. September 27, 2008. ^ "Nevada vs. Idaho – Game Recap". ESPN.com. October 4, 2008. ^ "Homecoming: Idaho Vandals vs. Fresno State Bulldogs – The Collegian". collegian.csufresno.edu. ^ "Tech Downs Idaho 46–14". ^ "New Mexico State vs. Idaho – Game Recap". ESPN.com. October 25, 2008. ^ "Football Posts 30–24 Win At Idaho; Now 6–3". ^ "COL FB: Boise State 45, Idaho 10". ^ "Warriors wash away Idaho's chance for victory – Hawaii News Now – KGMB and KHNL". ^ "2009 Idaho Vandals Schedule and Results - College Football at Sports-Reference.com". College Football at Sports-Reference.com. ^ "Idaho vs. New Mexico State – Game Recap". ESPN.com. September 5, 2009. ^ "Idaho vs. Washington – Game Recap". ESPN.com. September 12, 2009. ^ "Aztecs lose to Vandals, 34–20". ^ "Huskies' Comeback Falls Short in 34–31 Loss to Idaho". ^ "Colorado State vs. Idaho – Game Recap". ESPN.com. October 3, 2009. ^ "Idaho vs. San José State – Game Recap". ESPN.com. October 10, 2009. ^ "Vandals Pull Away From Warriors, 35–23". ^ "Nevada 70, Idaho 45". ^ "Louisiana Tech vs. Idaho – Game Recap". ESPN.com. October 31, 2009. ^ "Fresno State vs. Idaho – Game Recap". ESPN.com. November 7, 2009. ^ "Boise State 63, Idaho 25". ^ "Utah State 52, Idaho 49". ^ "Bowling Green vs. Idaho – Game Recap". ESPN.com. December 30, 2009. ^ "National Football League: NFL Draft 2010 – Mike Iupati". www.nfl.com. ^ "Iupati becomes second highest pick ever from Idaho", Seattle Post-Intelligencer, April 22, 2010 [dead link]. ^ "Idaho agrees to new contract with coach Akey". ESPN.com. March 15, 2010. ^ "2010 Idaho Vandals Schedule and Results - College Football at Sports-Reference.com". College Football at Sports-Reference.com. ^ "Football strong in debut". ^ Olson, Eric. "Martinez, defense carry No. 6 Huskers to 38–17 win". ^ "UNLV vs. Idaho – Game Recap". ESPN.com. September 18, 2010. ^ "Late field goal lifts Colorado State to 36–34 win". September 25, 2010. ^ "Idaho vs. Western Michigan – Game Recap". ESPN.com. October 2, 2010. ^ "Louisiana Tech 48, Idaho 35 – FOX Sports". October 17, 2010. ^ "Idaho rolls past New Mexico State 37–14". October 24, 2010. ^ "Hawaii Crushes Idaho 45–10". ^ "No. 25 Nevada beats Idaho 63–17". November 6, 2010. ^ "No. 4 Boise State mashes Idaho 52–14 – College football". November 12, 2010. ^ "ksl.com – Idaho beats Utah State 28–6". www.ksl.com. ^ "Dogs Down Idaho, 23–20". ^ "San José State vs. Idaho – Game Recap". ESPN.com. December 4, 2010. ^ "2011 Idaho Vandals Schedule and Results - College Football at Sports-Reference.com". College Football at Sports-Reference.com. ^ "BGSU takes Idaho 32–15 in opener". September 2, 2011. ^ "North Dakota vs. Idaho – Game Recap". ESPN.com. September 10, 2011. ^ "Idaho vs. Texas A&M – Game Recap". ESPN.com. September 17, 2011. ^ "Fresno State vs. Idaho – Game Recap". ESPN.com. September 24, 2011. ^ "Virginia escapes Idaho upset bid 21–20 in OT". October 1, 2011. ^ "Vandals lose to Louisiana Tech". ^ Staff, ABQJournal News. "Aggies Defense Steps Up vs. Idaho". www.abqjournal.com. ^ "Hawai'i vs. Idaho – Game Recap". ESPN.com. October 29, 2011. ^ "Idaho vs. San José State – Game Recap". ESPN.com. November 5, 2011. ^ "Idaho vs. BYU – Game Recap". ESPN.com. November 12, 2011. ^ "Utah State defeats Idaho 49-42 in double overtime". ^ "Idaho vs. Nevada – Game Recap". ESPN.com. December 3, 2011. ^ "2012 Idaho Vandals Schedule and Results - College Football at Sports-Reference.com". College Football at Sports-Reference.com. ^ "Eastern Washington vs. Idaho – Game Recap". ESPN.com. August 30, 2012. ^ "Idaho vs. Bowling Green – Game Recap". ESPN.com. September 8, 2012. ^ "Idaho vs. LSU – Game Recap". ESPN.com. September 15, 2012. ^ "Wyoming vs. Idaho – Game Recap". ESPN.com. September 22, 2012. ^ "Idaho vs. North Carolina – Game Recap". ESPN.com. September 29, 2012. ^ "Idaho gets 1st win, beats New Mexico State 26–18". ^ "Idaho vs. Texas State – Game Recap". ESPN.com. October 13, 2012. ^ "Idaho vs. Louisiana Tech – Game Recap". ESPN.com. October 20, 2012. ^ "Idaho fires football coach Akey after 1–7 record". ^ Coleman, Scott (October 21, 2012). "Robb Akey 'relieved of his duties', Jason Gesser interim coach". SB Nation. Retrieved October 26, 2012. ^ "Robb Akey Coaching Record". College Football at Sports-Reference.com. ^ "Offensive coordinator Jason Gesser introduced as interim head coach at Idaho after Akey firing". October 22, 2012. ^ "San José State vs. Idaho – Game Recap". ESPN.com. November 3, 2012. ^ "Idaho vs. BYU – Game Recap". ESPN.com. November 10, 2012. ^ "UTSA holds off Idaho for seventh win of season, 34–27". University of Texas at San Antonio. ^ DeBruin, Lynn. "Keeton, defense lift Utah State past Idaho 45–9". ^ "Former Idaho coach Robb Akey files lawsuit against Vandals". ^ a b "Idaho taps Arkansas OC Paul Petrino as coach". ^ "Bobby and Paul Petrino at ends of CFB's financial divide". ^ a b "University of Idaho Vandals Athletics". www.govandals.com. ^ "Idaho hires Arkansas' Paul Petrino as head football coach" – via Associated Press. ^ a b c "Vandals name Paul Petrino new football coach". ^ "Arkansas fires Petrino as head football coach". ^ Wright, Josh (December 4, 2012). "Vandals name Paul Petrino new football coach". The Spokesman-Review. Retrieved December 4, 2012. ^ "Hogs bring back coach Smith with 1-year deal". ^ Regan, Barry. "New Arkansas Razorback Coach: 4 Reasons Why John L. Smith Was the Right Hire". ^ "Petrino completes UI staff, adds four players". ^ "Pay rises yet again for college football's new coaching hires". ^ "Idaho joining Sun Belt". ^ "WAC to drop football after 2012 season, commissioner Hurd says". August 20, 2012. ^ "2013 Idaho Vandals Schedule and Results - College Football at Sports-Reference.com". College Football at Sports-Reference.com. ^ "Idaho vs. North Texas – Game Recap". ESPN.com. August 31, 2013. ^ "Idaho vs. Wyoming – Game Recap". ESPN.com. September 7, 2013. ^ "Northern Illinois vs. Idaho – Game Recap". ESPN.com. September 14, 2013. ^ "Idaho vs. Washington State – Game Recap". ESPN.com. September 21, 2013. ^ "Temple vs. Idaho – Game Recap". ESPN.com. September 28, 2013. ^ "Fresno State vs. Idaho – Game Recap". ESPN.com. October 5, 2013. ^ "Idaho vs. Arkansas State – Game Recap". ESPN.com. October 12, 2013. ^ "Idaho vs. Ole Miss – Game Recap". ESPN.com. October 26, 2013. ^ "Texas State vs. Idaho – Game Recap". ESPN.com. November 2, 2013. ^ "Old Dominion beats Idaho in 59–38 shootout". November 8, 2013. ^ "Idaho vs. Florida State – Game Recap". ESPN.com. November 23, 2013. ^ "Idaho vs. New Mexico State – Game Recap". ESPN.com. November 30, 2013. ^ "2014 Idaho Vandals Schedule and Results - College Football at Sports-Reference.com". College Football at Sports-Reference.com. ^ "Florida to pay Idaho $975K for canceled game". ^ "Idaho vs. Louisiana Monroe – Game Recap". ESPN.com. September 6, 2014. ^ "Western Michigan vs. Idaho – Game Recap". ESPN.com. September 13, 2014. ^ "Idaho vs. Ohio – Game Recap". ESPN.com. September 20, 2014. ^ "South Alabama defense stops Idaho 34–10". September 27, 2014. ^ "Idaho vs. Texas State – Game Recap". ESPN.com. October 4, 2014. ^ "Idaho vs. Georgia Southern – Game Recap". ESPN.com. October 11, 2014. ^ "New Mexico State vs. Idaho – Game Recap". ESPN.com. October 18, 2014. ^ "Arkansas State vs. Idaho – Game Recap". ESPN.com. November 1, 2014. ^ "Idaho vs. San Diego State – Game Recap". ESPN.com. November 8, 2014. ^ "Troy vs. Idaho – Game Recap". ESPN.com. November 15, 2014. ^ "Idaho vs. Appalachian State – Game Recap". ESPN.com. November 29, 2014. ^ "Idaho coach Paul Petrino angrily confronts reporter, restrained". ^ "Paul Petrino addresses report about incident with media". foxsports.com. August 20, 2015. Retrieved October 15, 2017. ^ Wire, SI. "Idaho coach Paul Petrino confronts reporter". ^ "2015 Idaho Vandals Schedule and Results - College Football at Sports-Reference.com". College Football at Sports-Reference.com. ^ "Ohio dominates Idaho, 45–28". ^ "Idaho vs. USC – Game Recap". ESPN.com. September 12, 2015. ^ "Idaho needs comeback to beat Wofford 41–38". ^ "Georgia Southern vs. Idaho – Game Summary". ESPN.com. September 26, 2015. ^ "Arkansas State beats Idaho 49–35". ^ "Idaho vs. Troy – Game Recap". ESPN.com. October 17, 2015. ^ "Louisiana Monroe vs. Idaho – Game Recap". ESPN.com. October 24, 2015. ^ "Idaho vs. New Mexico State – Game Recap". ESPN.com. October 31, 2015. ^ "Idaho vs. South Alabama – Game Recap". ESPN.com. November 7, 2015. ^ "Appalachian State vs. Idaho – Game Recap". ESPN.com. November 14, 2015. ^ "Idaho vs. Auburn – Game Recap". ESPN.com. November 21, 2015. ^ "Texas State vs. Idaho – Game Recap". ESPN.com. November 28, 2015. ^ "Paul Petrino not returning to U of L". ^ "Idaho will become first team to drop from FBS to FCS in 2018". ^ "Idaho to be 1st school to drop from FBS to FCS". ^ "Idaho extends Paul Petrino's contract through 2020". ^ "2016 Idaho Vandals Schedule and Results - College Football at Sports-Reference.com". College Football at Sports-Reference.com. ^ a b "Idaho breaks Potato Bowl yardage record in victory over Colorado State". ^ "Montana State vs. Idaho – Game Recap". ESPN.com. September 1, 2016. ^ "Idaho vs. Washington – Game Recap". ESPN.com. September 10, 2016. ^ "WSU Cougars beat Idaho 56–6 to notch first win of the season". September 17, 2016. ^ "Idaho vs. UNLV – Game Recap". ESPN.com. September 24, 2016. ^ "Troy vs. Idaho – Game Recap". ESPN.com. October 1, 2016. ^ "Idaho vs. Louisiana Monroe – Game Recap". ESPN.com. October 8, 2016. ^ "New Mexico State vs. Idaho – Game Recap". ESPN.com. October 15, 2016. ^ "Idaho vs. Appalachian State – Game Recap". ESPN.com. October 22, 2016. ^ "Idaho vs. Louisiana – Game Recap". ESPN.com. November 5, 2016. ^ "Idaho vs. Texas State – Game Recap". ESPN.com. November 12, 2016. ^ "South Alabama vs. Idaho – Game Recap". ESPN.com. November 26, 2016. ^ "Georgia State vs. Idaho – Game Recap". ESPN.com. December 3, 2016. ^ "Idaho vs. Colorado State – Game Recap". ESPN.com. December 22, 2016. ^ "Report: WKU talks to Petrino (no, not that one)". ^ "Western Kentucky names Irish OC Sanford coach". ^ "2017 Idaho Vandals Schedule and Results - College Football at Sports-Reference.com". College Football at Sports-Reference.com. ^ "Sacramento State vs. Idaho – Game Recap". ESPN.com. August 31, 2017. ^ "UNLV vs. Idaho – Game Recap". ESPN.com. September 9, 2017. ^ "Idaho vs. Western Michigan – Game Recap". ESPN.com. September 16, 2017. ^ "Idaho vs. South Alabama – Game Recap". ESPN.com. September 23, 2017. ^ "Louisiana vs. Idaho – Game Recap". ESPN.com. October 7, 2017. ^ "Appalachian State vs. Idaho – Game Recap". ESPN.com. October 14, 2017. ^ "Idaho vs. Missouri – Game Recap". ESPN.com. October 21, 2017. ^ "Louisiana Monroe vs. Idaho – Game Recap". ESPN.com. October 28, 2017. ^ "Idaho vs. Troy – Game Recap". ESPN.com. November 2, 2017. ^ "Coastal Carolina vs. Idaho – Game Recap". ESPN.com. November 18, 2017. ^ "Idaho vs. New Mexico State – Game Recap". ESPN.com. November 25, 2017. ^ "Idaho vs. Georgia State – Game Recap". ESPN.com. December 2, 2017. ^ "Ostyn says Pacific cost major status". Spokesman-Review. Spokane, Washington. Associated Press. August 9, 1967. p. 15. ^ "NCAA ups 4 colleges". Pittsburgh Post-Gazette. Associated Press. July 2, 1969. p. 22. ^ a b "Axe falls on Idaho football program". Ellensburg Daily Record. Washington. UPI. December 7, 1973. p. 7. ^ Johnson, Bob (January 31, 1964). "Vandals versus Big Sky". Spokane Daily Chronicle. Spokane. p. 11. ^ "Only winning will satisfy Idaho this gridiron season". Spokesman-Review. Spokane, Washington. September 14, 1965. p. 18. ^ Payne, Bob (October 23, 1965). "Idaho opens campaign for Big Sky crown". Spokesman-Review. Spokane, Washington. p. 11. ^ Johnson, Bob (November 27, 1972). "Even 110 rides too few". Spokane Daily Chronicle. Washington. p. 17. ^ a b "Idaho bid is rejected again". Spokane Daily Chronicle. Washington. Associated Press. July 17, 1973. p. 15. ^ "Idaho given PCAA bid". Spokesman-Review. Spokane, Washington. Associated Press. June 8, 1973. p. 24. ^ "League accepts Vandals; Big Sky vote key factor". Spokane Daily Chronicle. Washington. Associated Press. June 8, 1973. p. 17. ^ Payne, Bob (July 22, 1973). "Robbins:'Gotta say something...'". Spokesman-Review. Spokane, Washington. p. 1-sports. ^ "Idaho board delays withdrawal action". Spokesman-Review. Spokane, Washington. Associated Press. June 16, 1973. p. 16. ^ "State board approves Idaho becoming FBS independent". USAToday. August 17, 2012. Retrieved October 20, 2012. ^ Murphy, Brian (October 9, 2012). "WAC adds Utah Valley, CSU Bakersfield; Will it be able to keep Idaho?". Idaho Statesman. Archived from the original on January 26, 2013. Retrieved October 20, 2012. ^ "Sun Belt Football to be 10 Teams in 2018". Sun Belt Conference. Retrieved March 1, 2016. ^ "Idaho Moving Football to Big Sky Conference". Big Sky Conference. Retrieved April 30, 2016. ^ "Idaho Conference Championships". College Football Data Warehouse. Archived from the original on October 20, 2012. Retrieved December 23, 2010. ^ "FCS Championship History (Known as I-AA from 1978–2006)". The FCS College Football Weekly Preview. Archived from the original on November 22, 2010. Retrieved December 23, 2010. ^ "Boise State-Idaho Rivalry Exists, Is Very Mean". ^ "mcubed.net : NCAAF Football : Series records : Idaho vs. Boise St". mcubed.net. ^ a b Staples, Andy. "Andy Staples: Boise State becoming what it once fought against". ^ "Idaho AD won't ride Boise State-themed plane". ESPN.com. November 12, 2009. ^ "Idaho State and Idaho Athletics UnveilL Multi-Year Rivalry Series Entitled "Battle of the Domes"". Idaho State University. ^ a b "Battle of the Domes Unveiled". Idaho Athletics. Retrieved October 17, 2017.